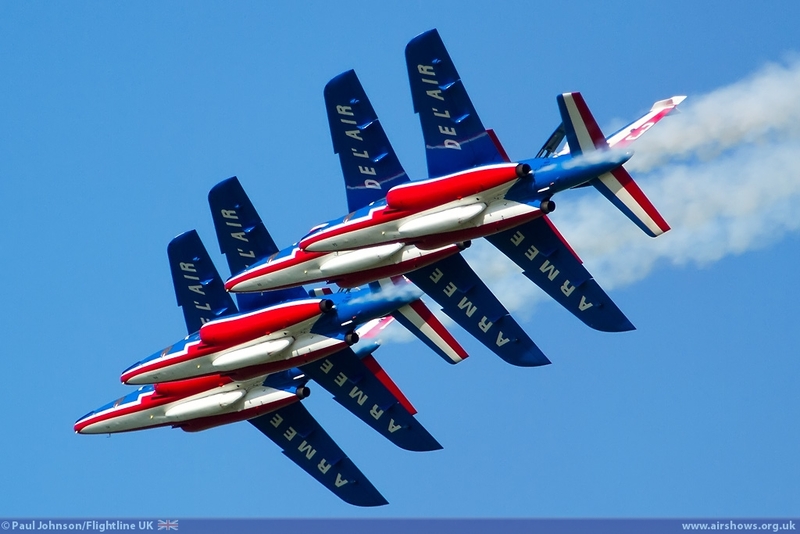 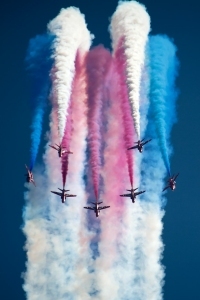 The second and the biggest of the Royal Air Force airshows takes place at RAF Waddington in Lincolnshire. 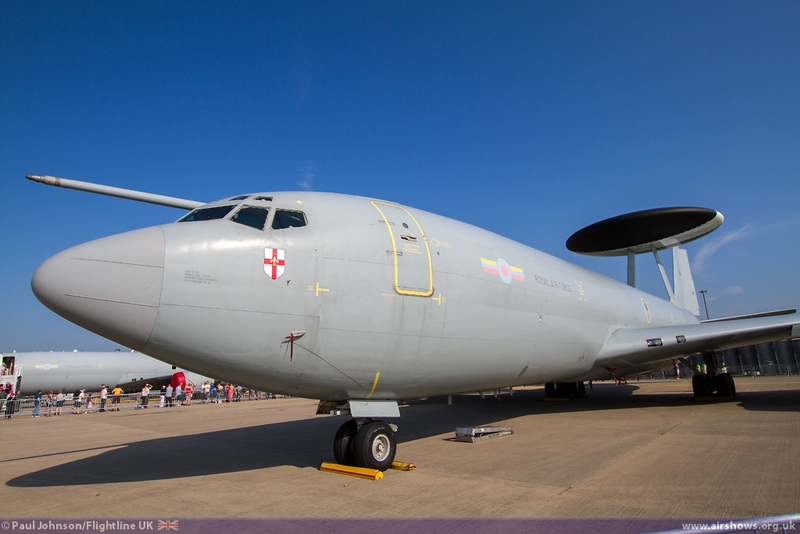 Waddington is home to the RAF's ISTAR fleet with the Boeing E-3S Sentry AEW1, Raytheon Sentinel R1 and Beechcraft Shadow R1 all operating from the base. 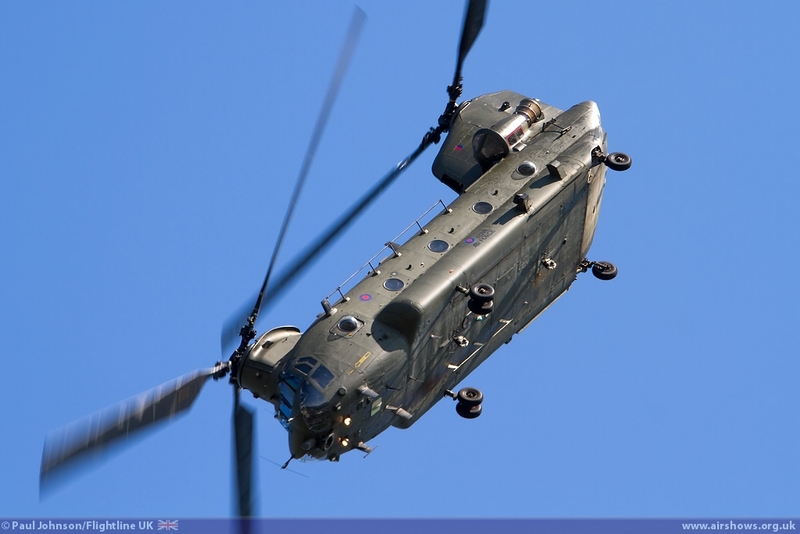 It is a time of exciting change for the base. 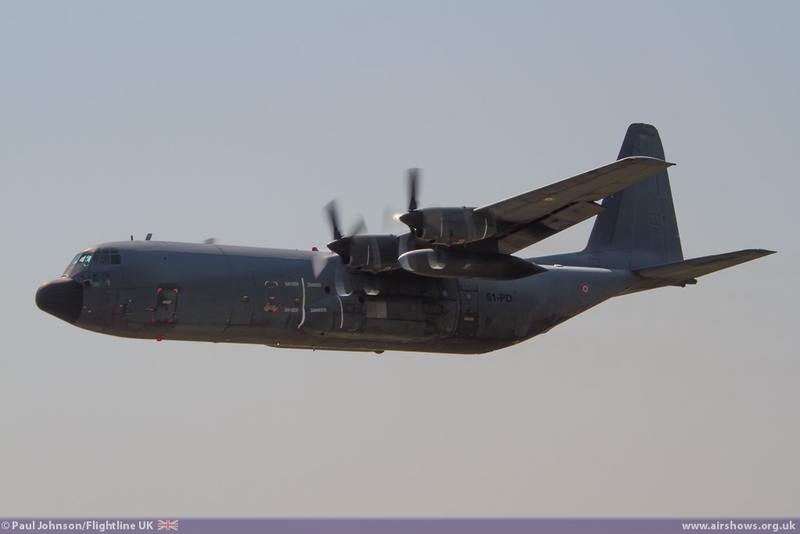 No 14 squadron recently started controlling some of the RAF's fleet of MQ-9 Reapers from the base in operations over Afghanistan and 51 Squadron's first Boeing RC-135W AIRSEEKER is also due to arrive very soon. 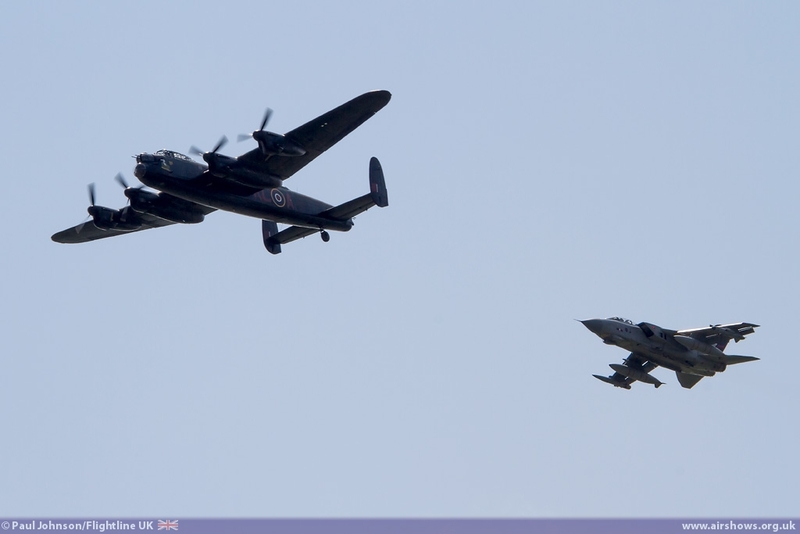 The 2013 airshow celebrated three major themes; the 95th Anniversary of the Royal Air Force, the 70th Anniversary of the Dambusters Road, ISTAR '13 and 100th Anniversary of No 5(AC) Squadron. 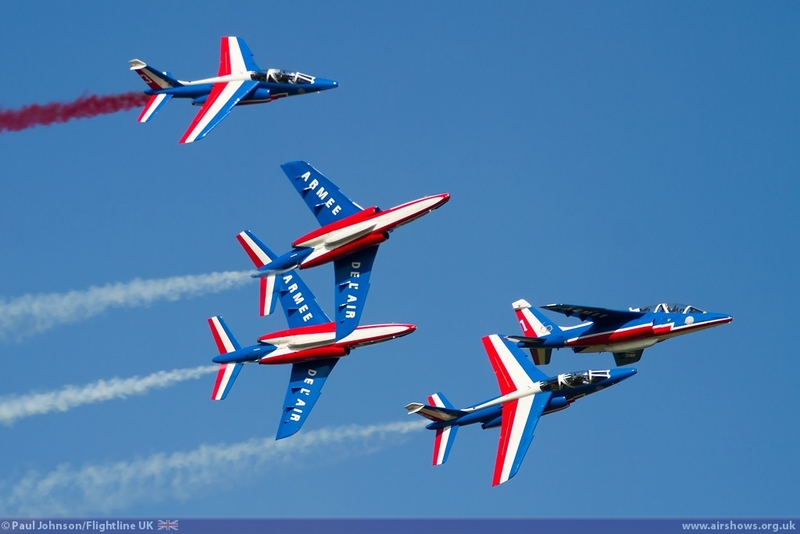 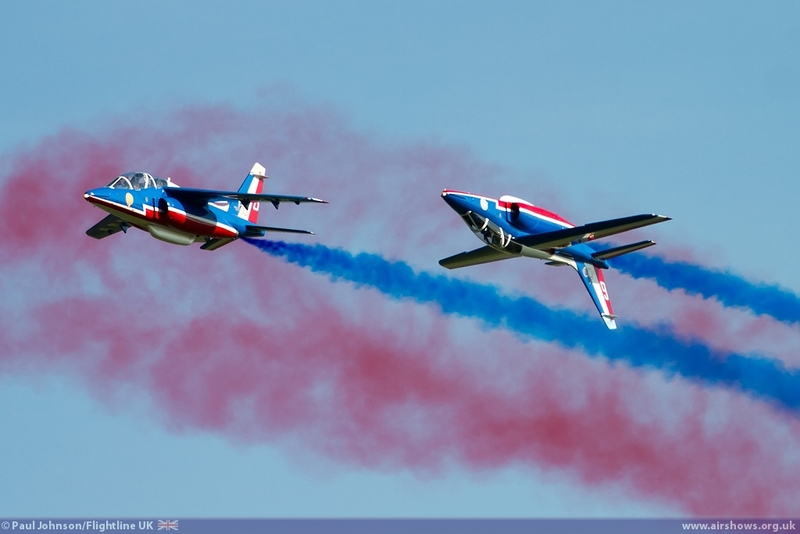 The 7 hour flying display not only featured all the RAF's display teams, but also a very international line-up of fast jet displays and an appearance by the French National Aerobatic Team, La Patrouille de France as well as a host of classic jets from the UK and Sweden. 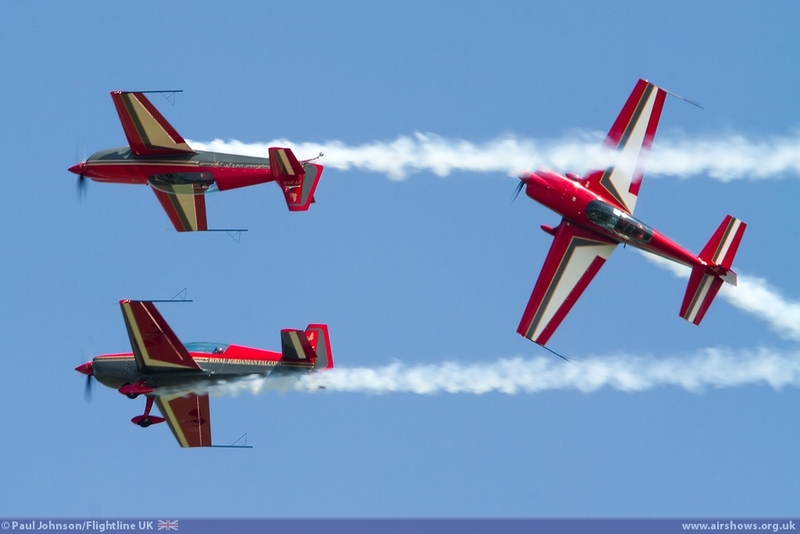 The RAF Waddington International Airshow 2013 had a tough act to follow considering the amazing multi-national airshow offered in 2012. 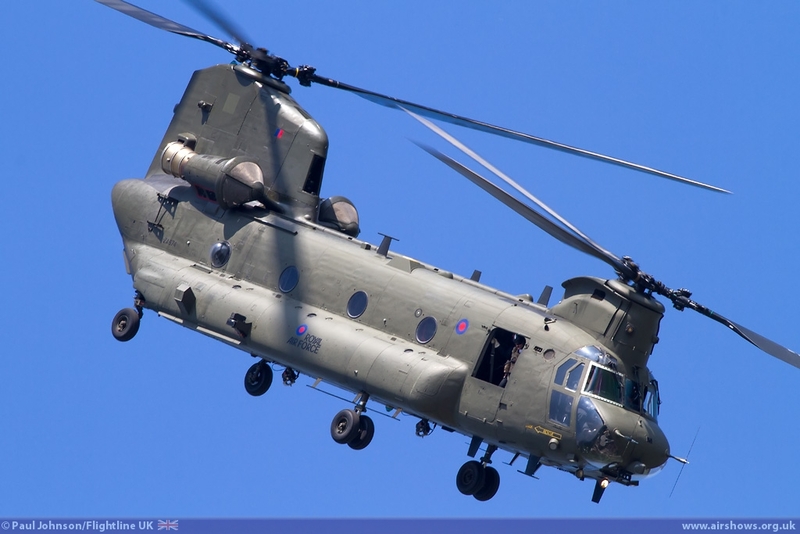 It was made all the more difficult by the rapidly contracting defence budgets around the world. 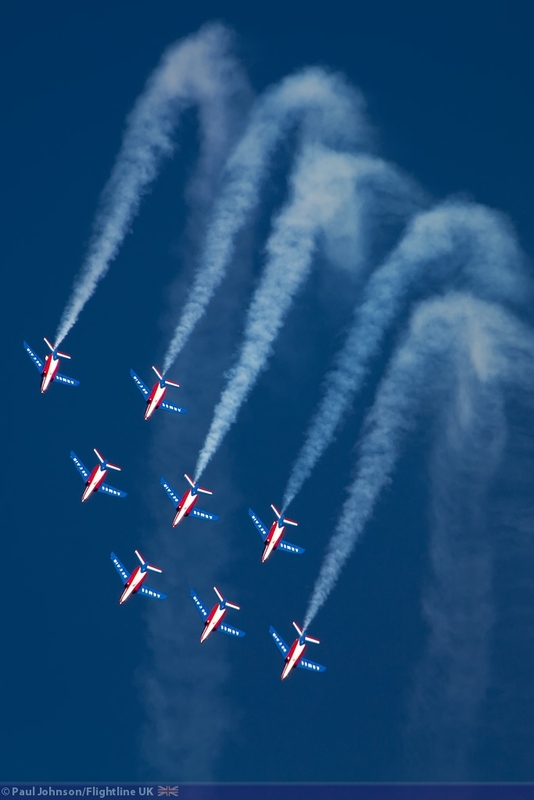 However, despite all that Waddington certainly succeeded in putting together an incredible show. The main aim of the show is to increase public awareness and understanding of the Royal Air Force and its important roles around the world. 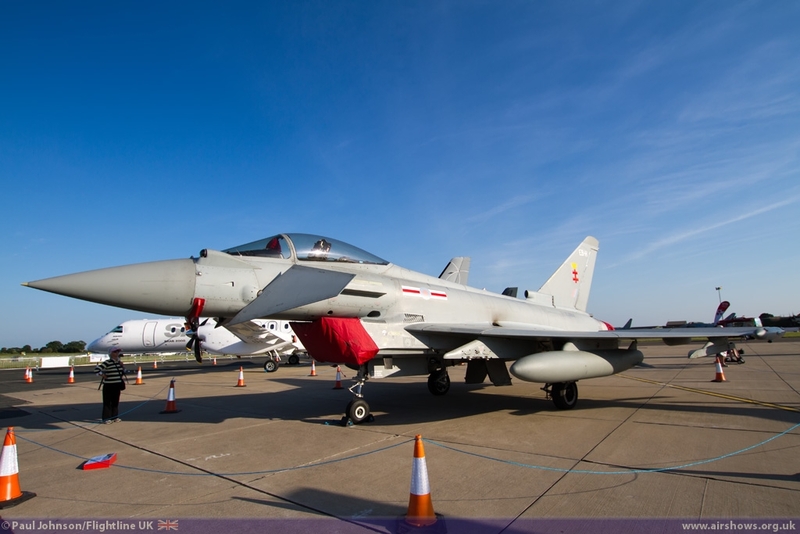 This not only involves aircraft, but also on the ground with several exhibitions in Waddington's enormous hangars. 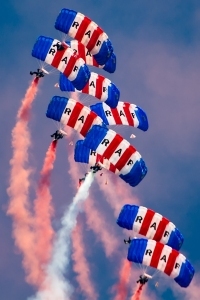 The biggest highlight of the ground activities is “RAF ON AIR” which was supported this year by BBC Lincolnshire. 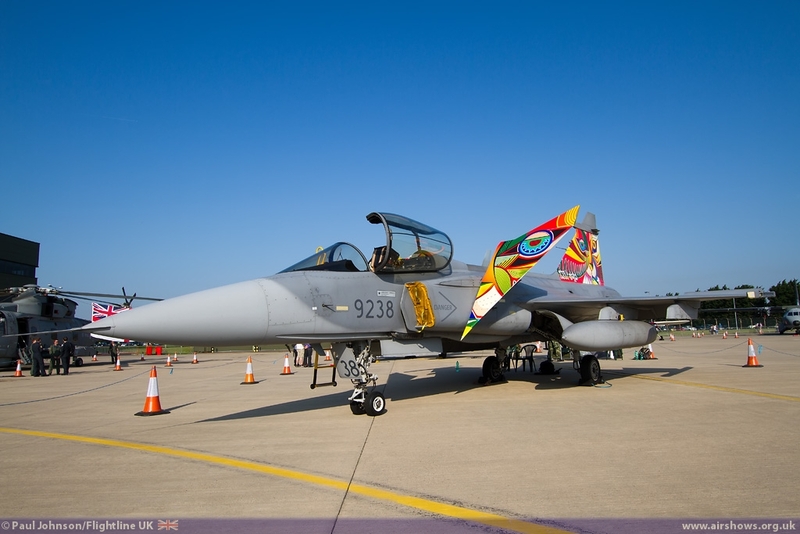 This combined an extensive multimedia exhibition with a stage and a large screen. 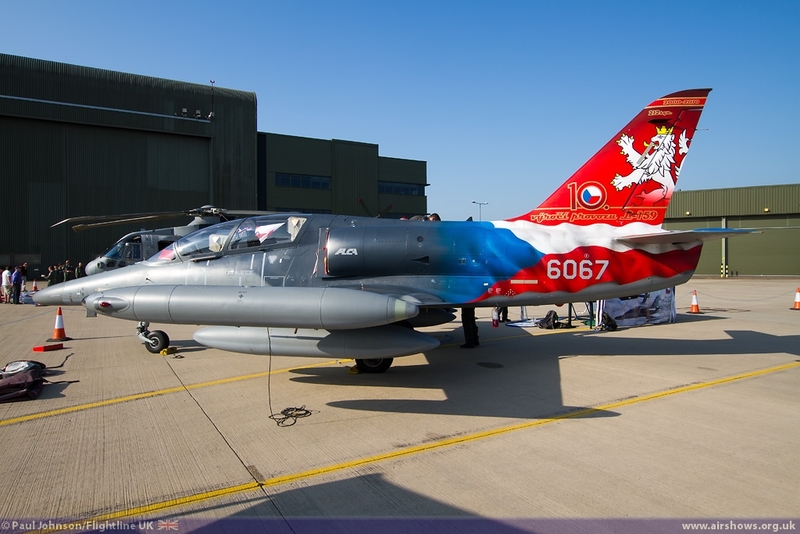 Throughout the weekend the many visiting aircrews were interviewed on stage about their careers, aspirations as well as their display routines if they were in the flying display. 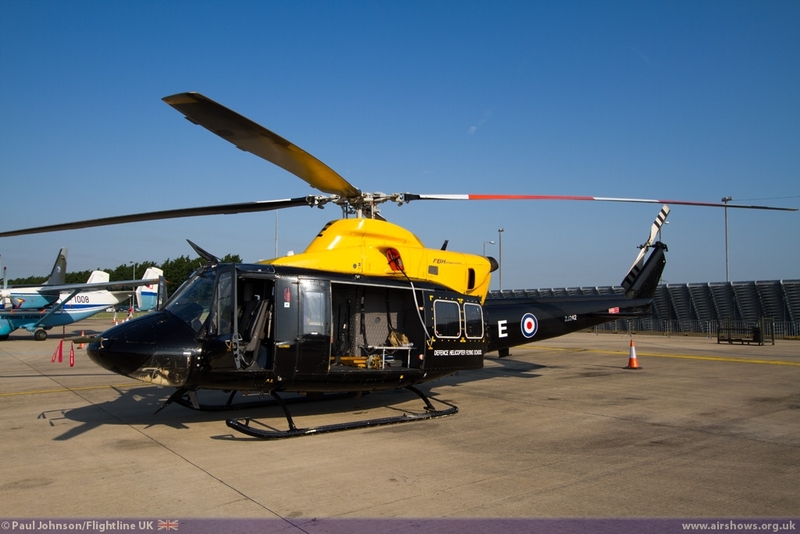 Also in the hangars were the RAF Presentation Team provided an insight to the work and life of the Royal Air Force. 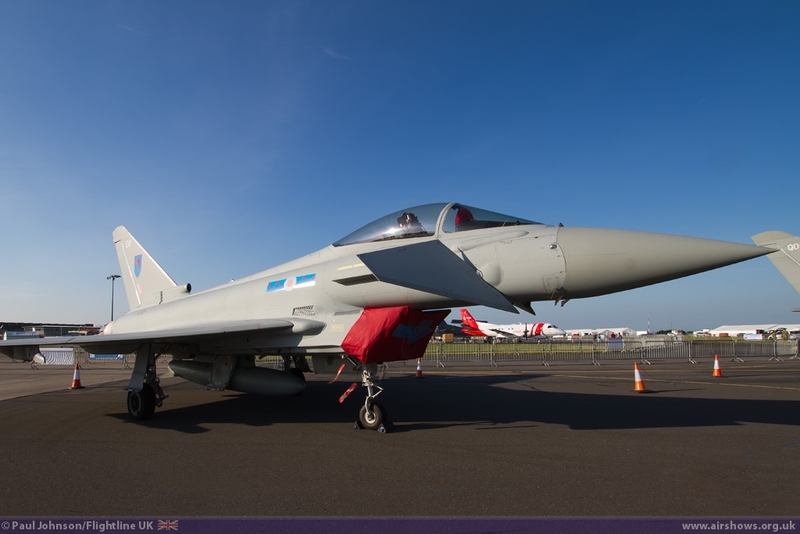 The static display featured a large number of RAF aircraft. 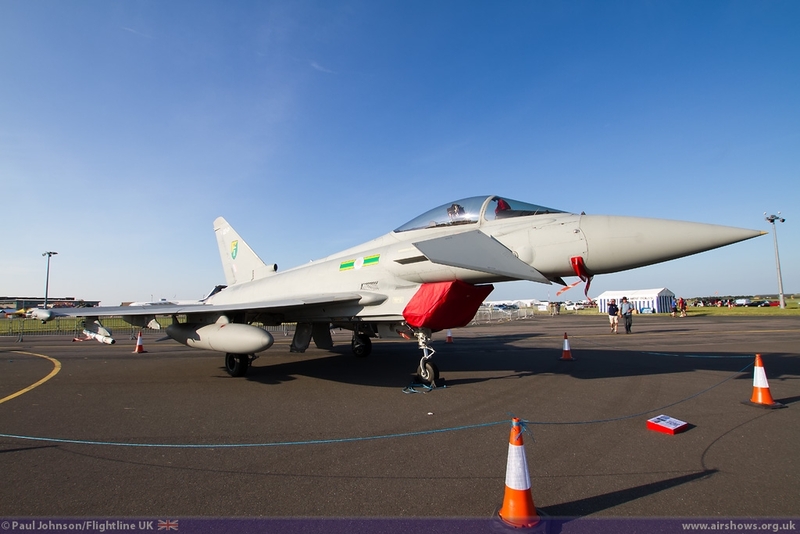 The Typhoon FGR4 featured well including a airshow debut from a Typhoon wearing the colours of 41(R) Squadron, the RAF's Operational Evaluation Squadron based at nearby RAF Coningsby. 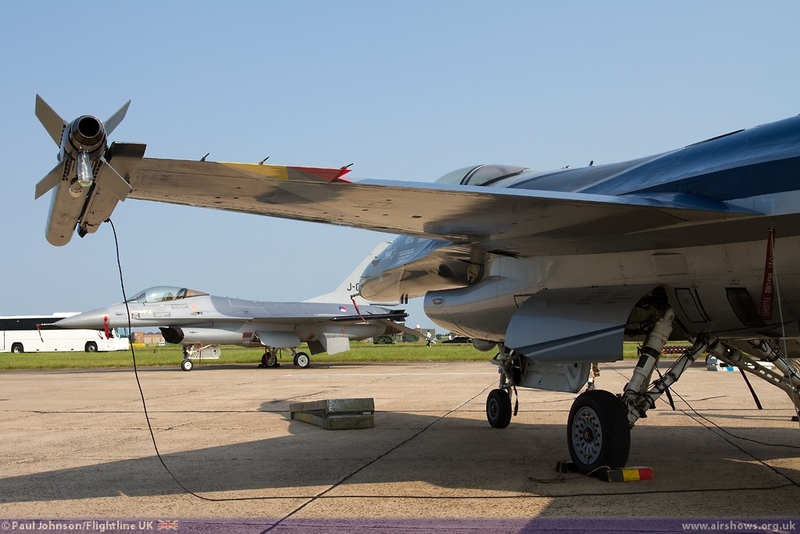 The former Typhoon OEU, 17(R) Squadron, has reformed in the United States in anticipation of the UK's F-35B Lightning II arriving at Edwards AFB in California. 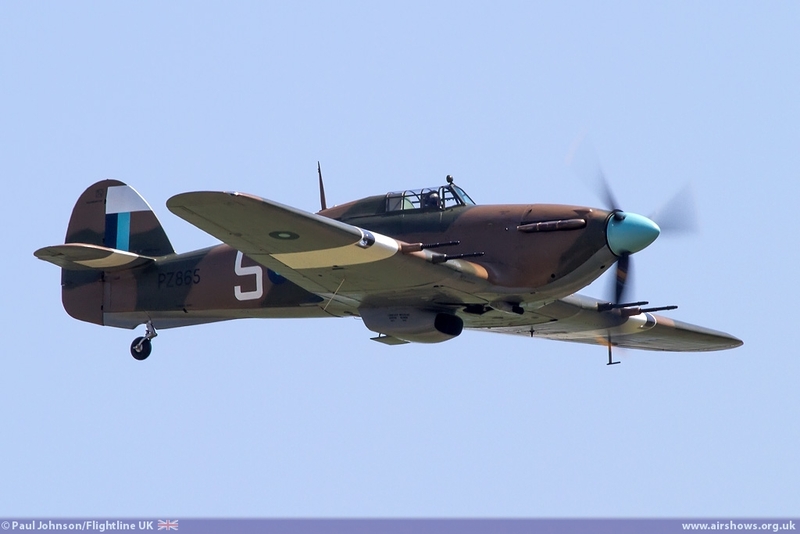 Further Typhoon's came from Nos 3 and 6(F) Squadrons. 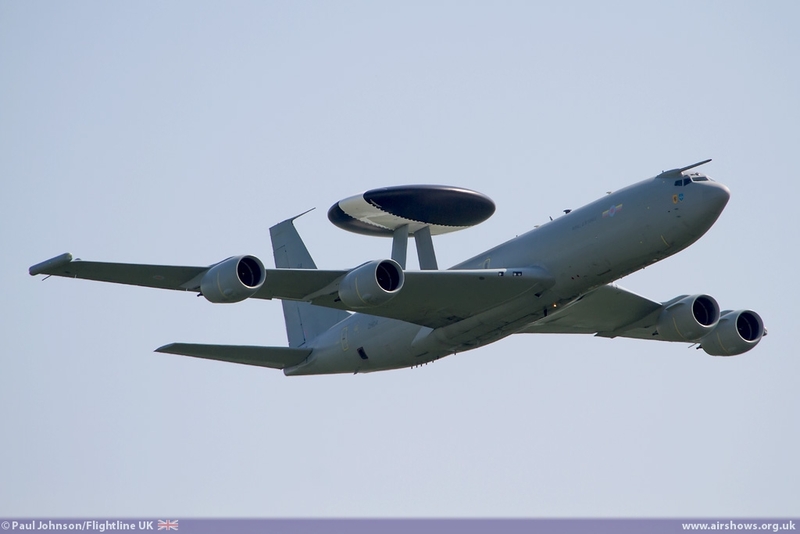 The home team was also represented by examples of the Sentry AEW1 and Sentinal R1. 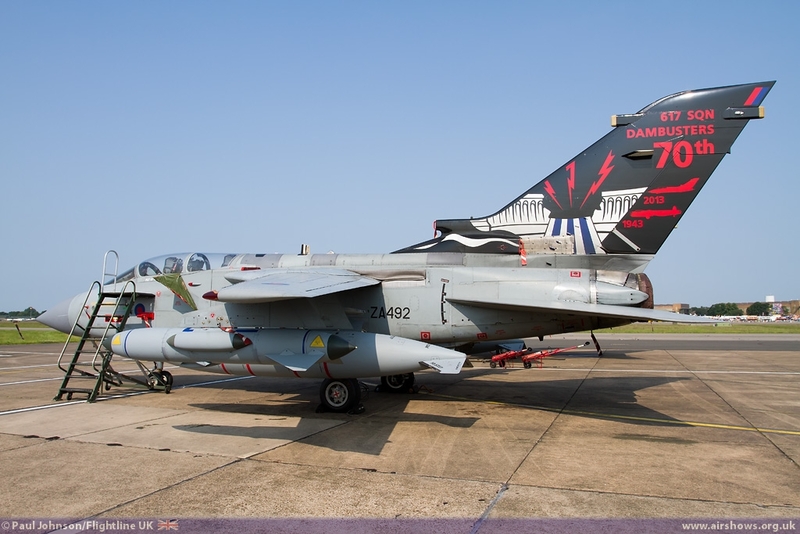 The static park also featured one of 617 Squadron's specially marked Tornado GR4s commemorating the 70th Anniversary of the Squadron's formation and the Dambusters raid. 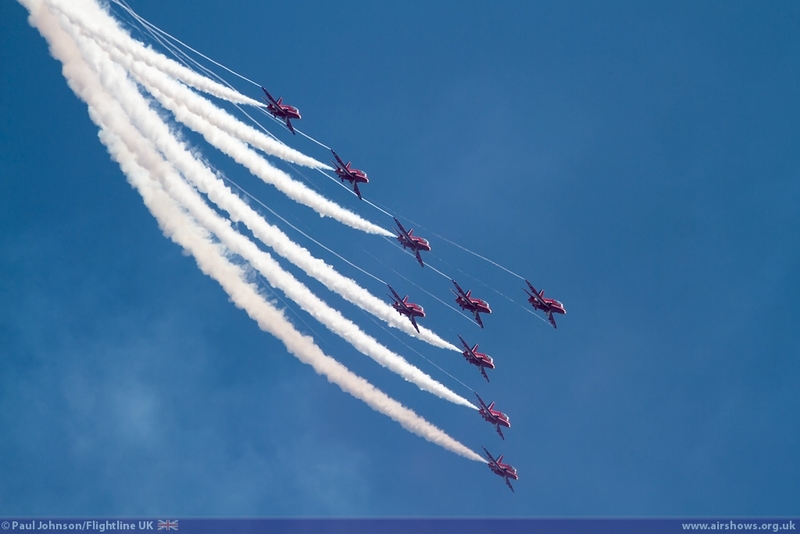 It was an important theme for Waddington as RAF Scampton just a few miles to the north was where 617 Squadron was based and Airshow is the closest major RAF sponsored public event. 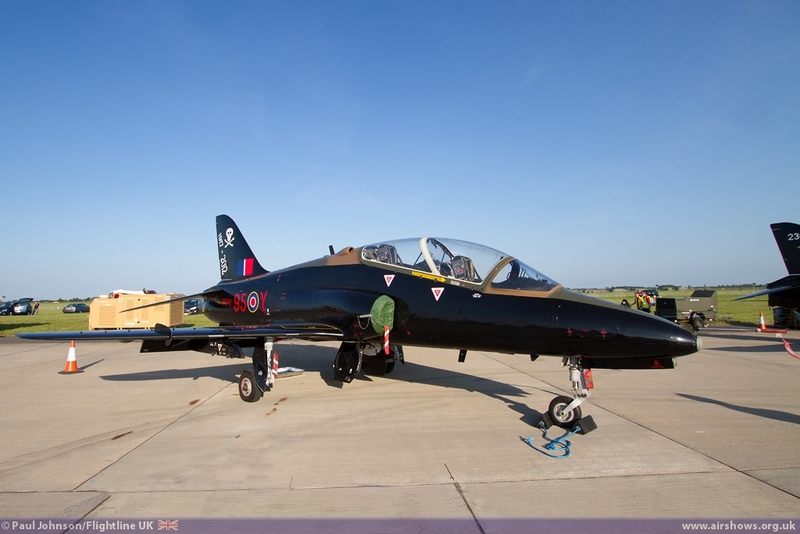 There was no Hawk T2 in the static display, though Hawk T1s came from 208(R) and 100 Squadrons. 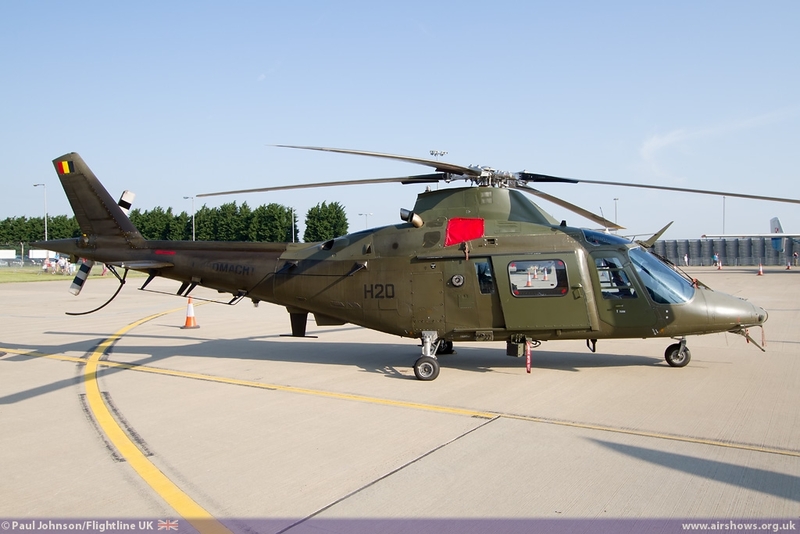 The RAF's fleet of helicopters are always popular attraction and Waddington saw an example of the Griffin HT1 in the static park. 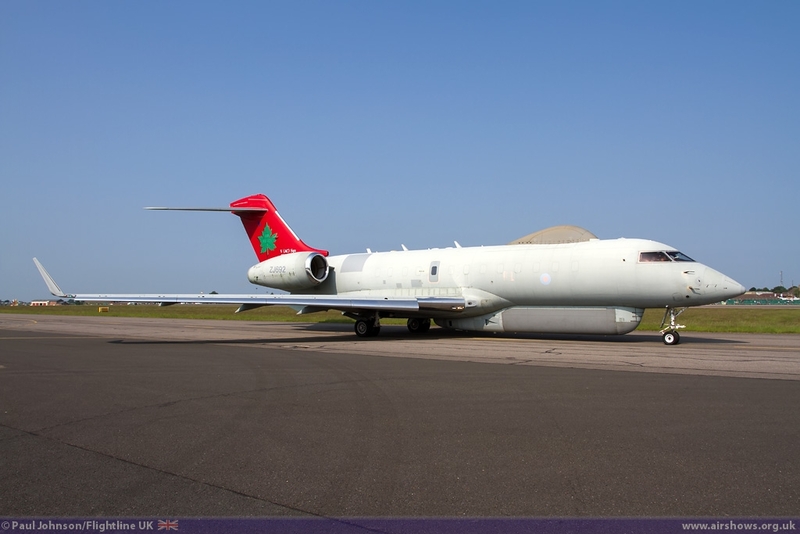 Of particularly note was the BAC VC-10 K3 from 101 Squadron, RAF Brize Norton which marked the types final ever appearance at the Waddington Airshow as it will finally disappears from RAF Service later this year. 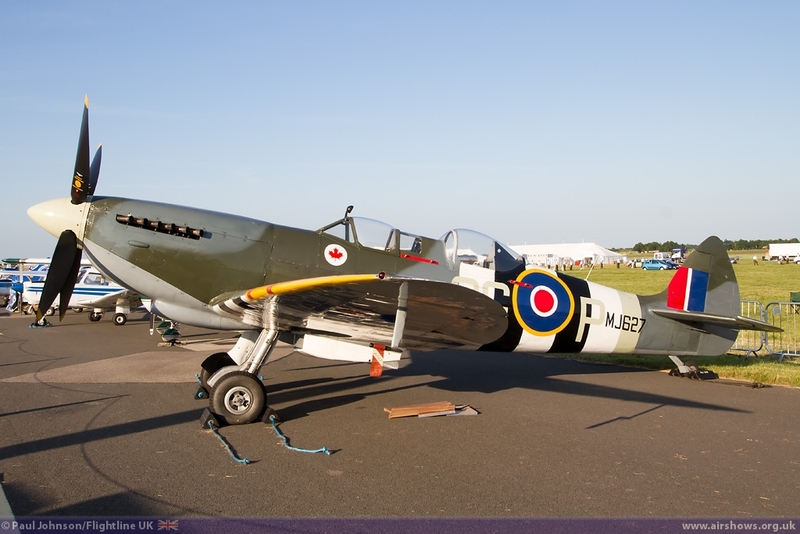 Though the airshow was celebrating the 95th Anniversary of the RAF, it was slightly surprising to see so few historic RAF aircraft at the show, particularly when previous years have seen great collections of World War One replicas, warbirds and classic jets included in the static line-up. 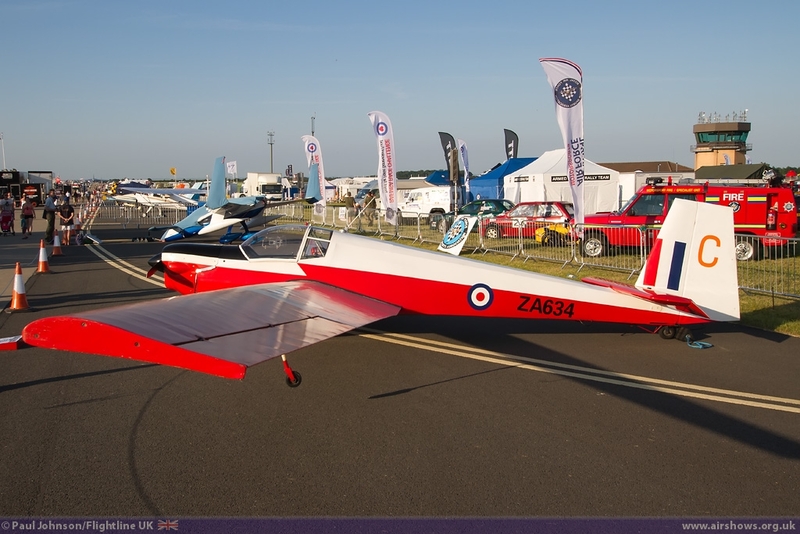 However, there were some gems in there including the Buckminster Gliding Club's Slingsby Venture, a gaggle of Jet Provost T3, T4 and T5s alongside some Chipmunks marking the 1950's and 1960's training aircraft of the Royal Air Force. 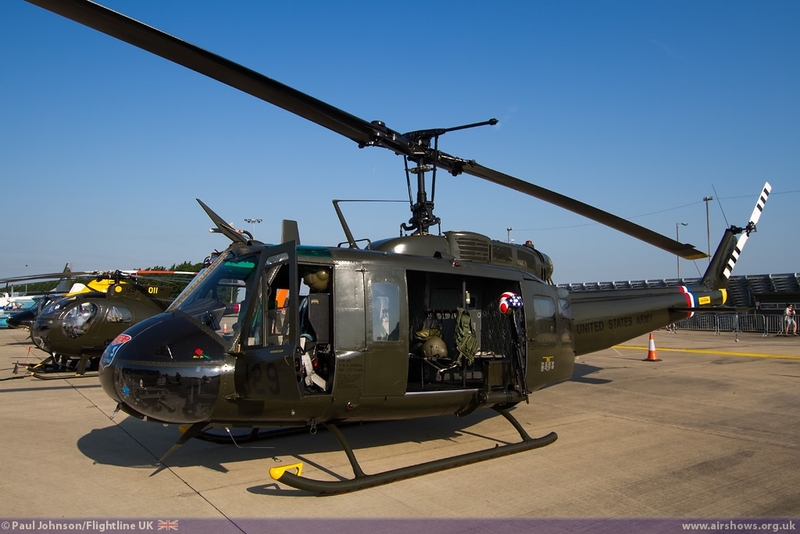 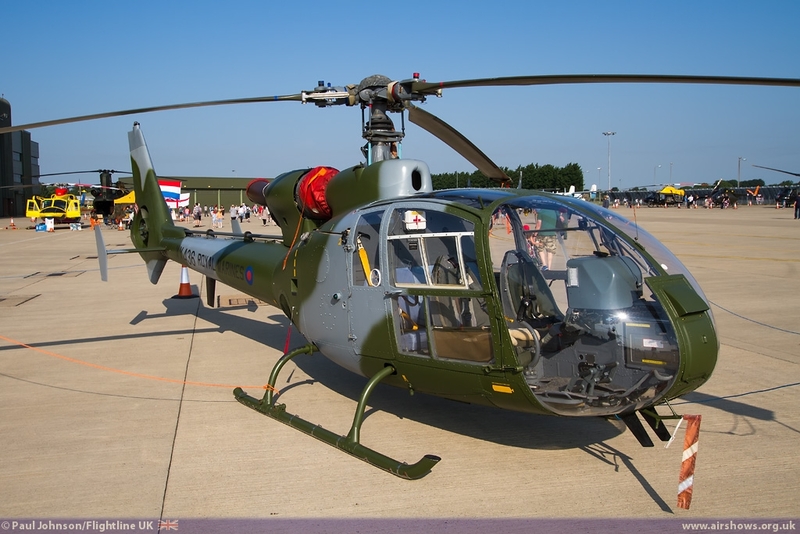 As ever there were some other great participants including the wonder UH-1H Iroquois and OH-6 Loach from the Huey Display Team plus other unusual types such as the L-29 Delphin, Piaggio P166 and MS376 Alyacon. 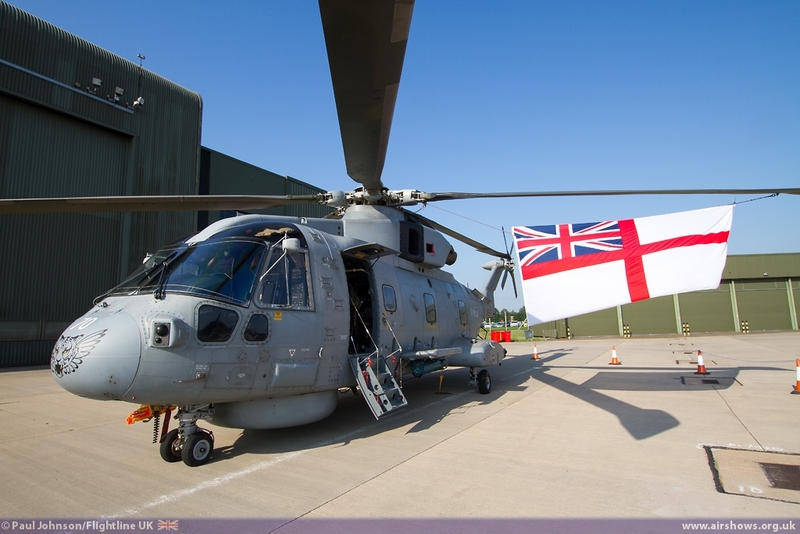 The Royal Navy participation was very impressive, particularly as this was an RAF show. 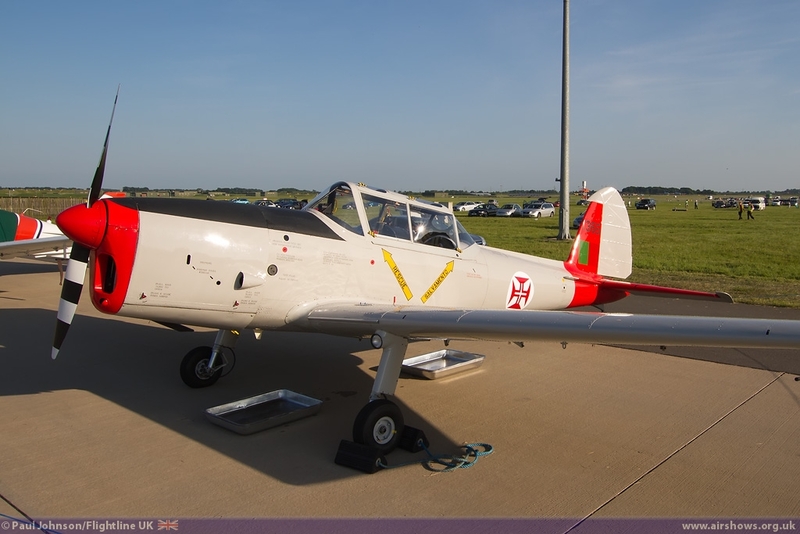 Standing out were first outing for Beechcraft Avenger T1 making their first appearances in the Waddington line-up. 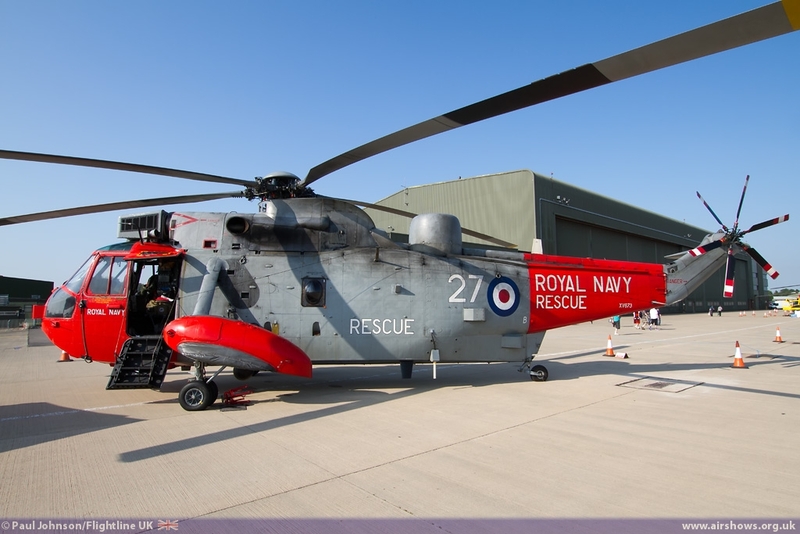 Culdrose also sent the Sea King AsaC7 and a Merlin HM1 as part of the ISTAR13 theme plus a Sea King HU5 Search and Rescue variant. 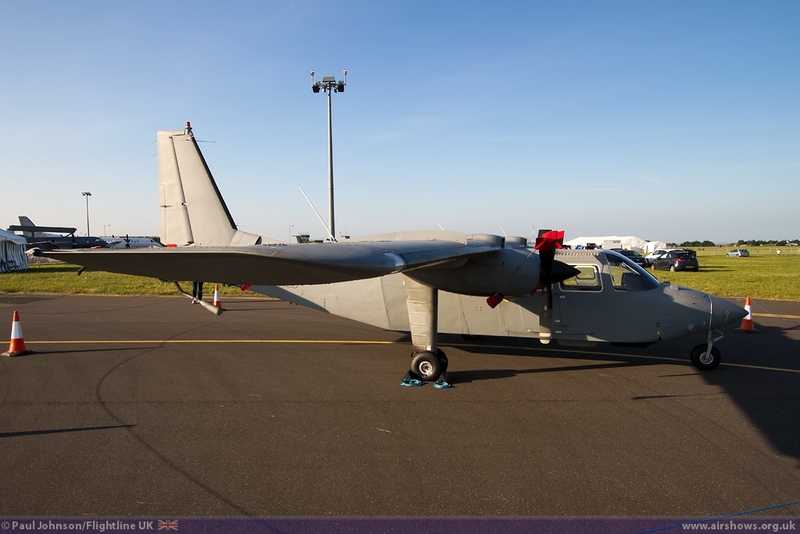 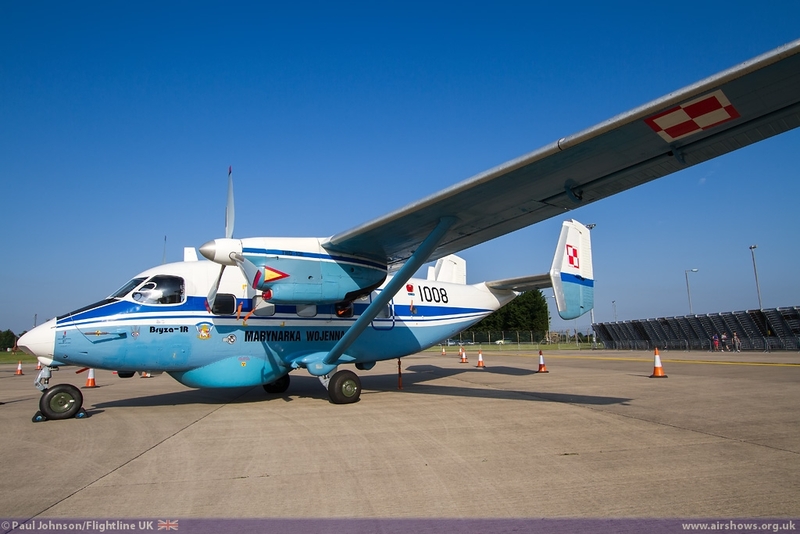 The sole Army representation in the static display was a Britten Norman Islander AL1. 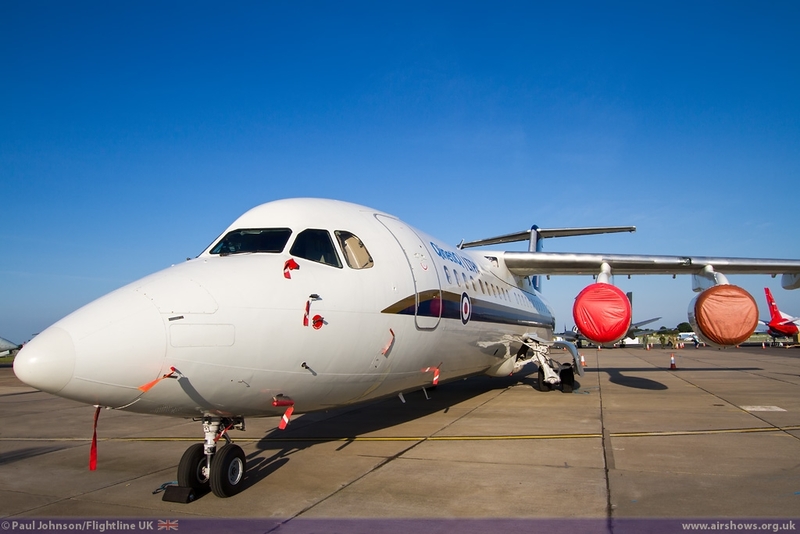 2013 also marks the 70th Anniversary of the Empire Test Pilots School and they were on the ground with the BAE Systems Avro RJ100 wearing the smart new ETPS scheme. 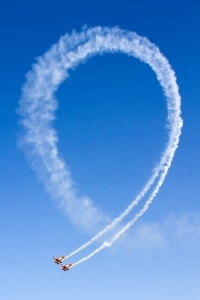 The International array of participants in the static park was particularly noteworthy in these leaner times. 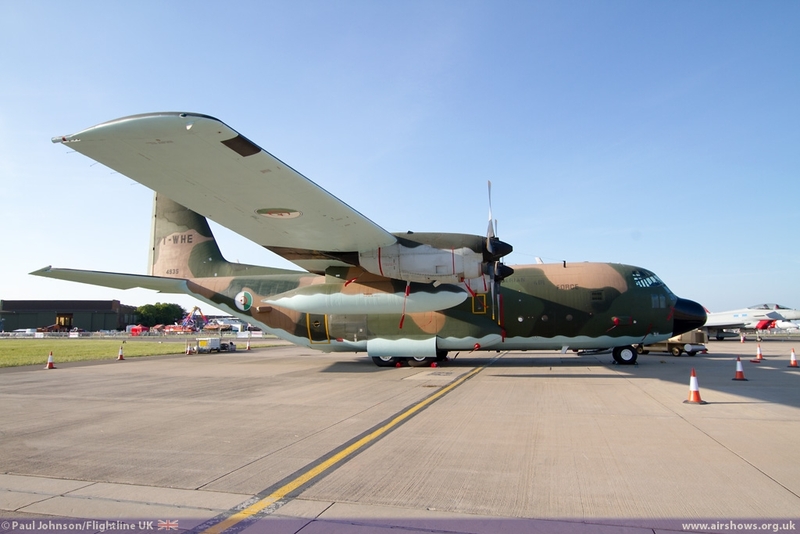 There was a good selection of transports standing over the rest of the aircraft with a Czech EADS CN295M, and a C-130H Hercules from Algeria. 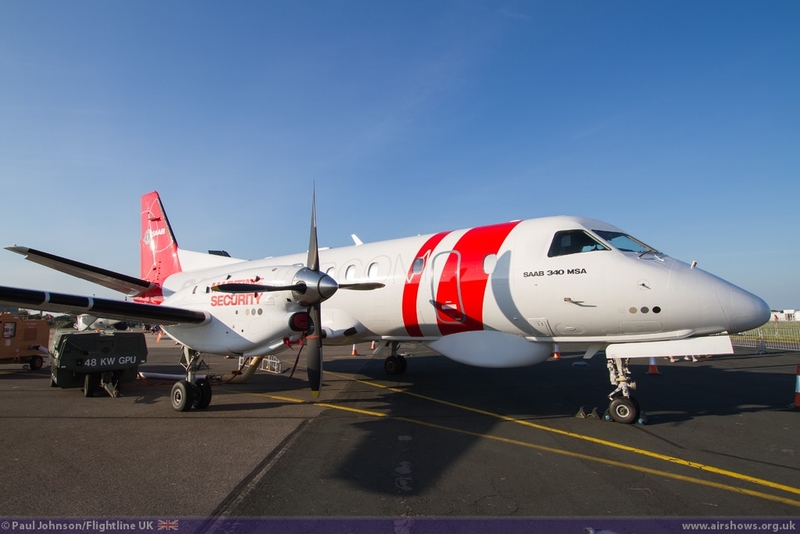 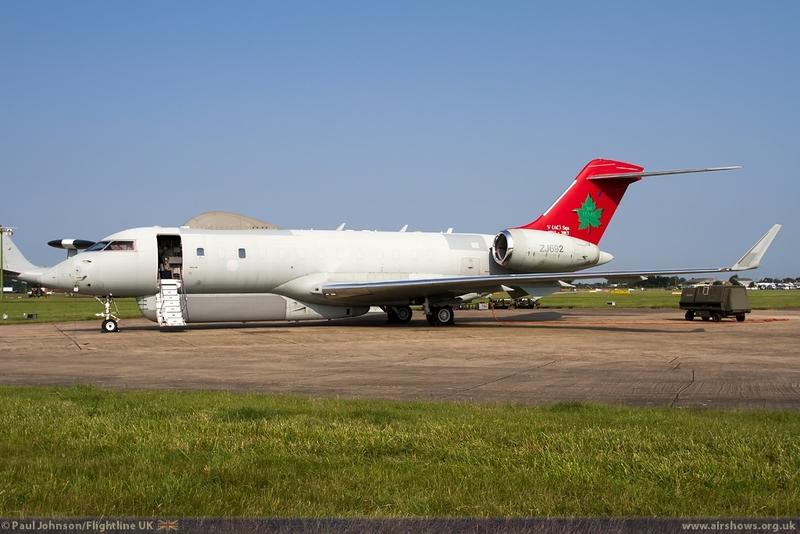 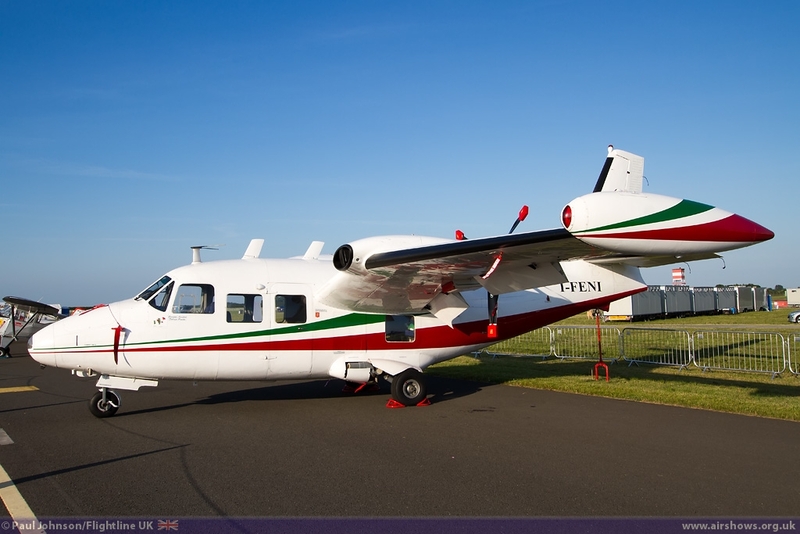 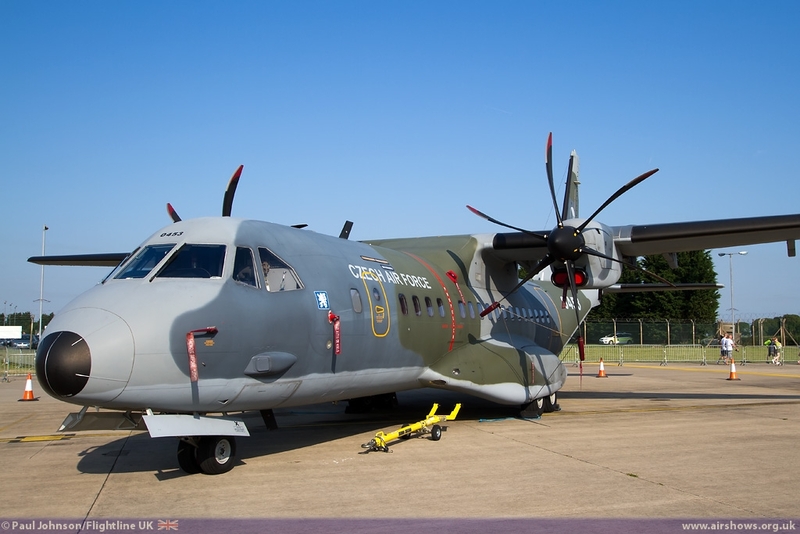 The ISTAR theme also saw participation from the Polish Navy with a colourful PZL M28-1R Bryza plus three demonstrators from SAAB; a SAAB 340AEW&C, SAAB 340MSA and a SAAB 2000MPA. 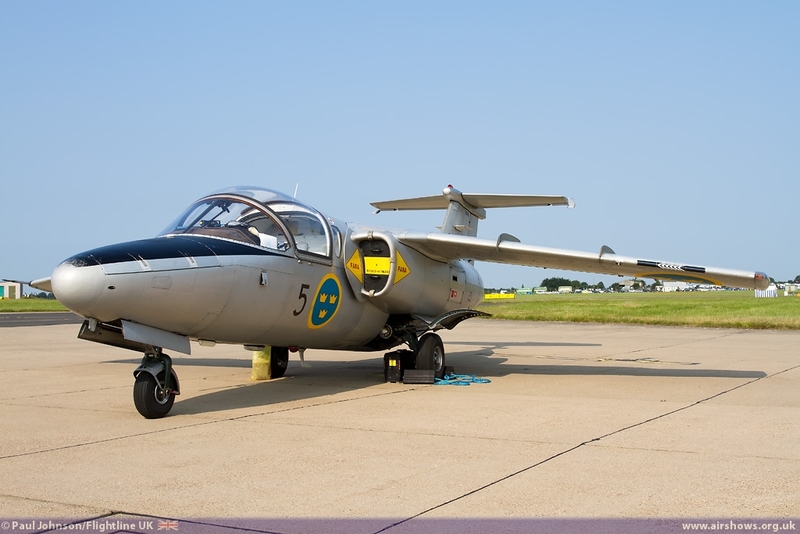 International fast jet and helicopter numbers were understandably down on previous years. 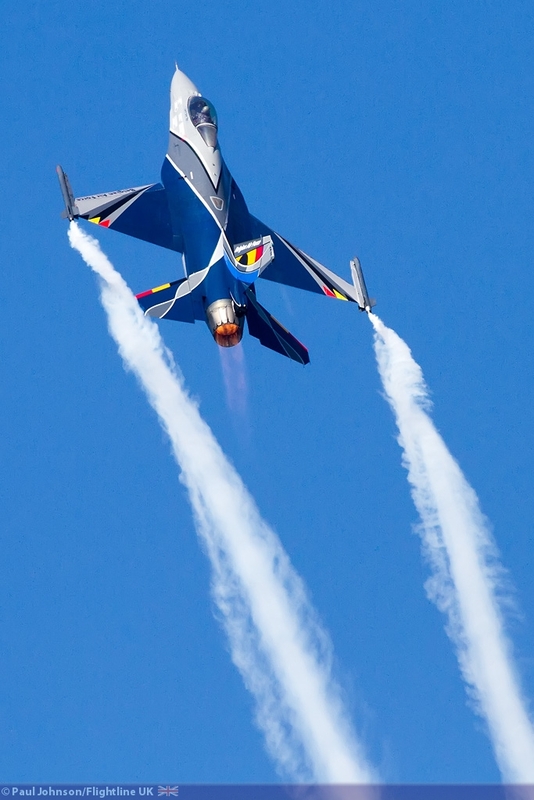 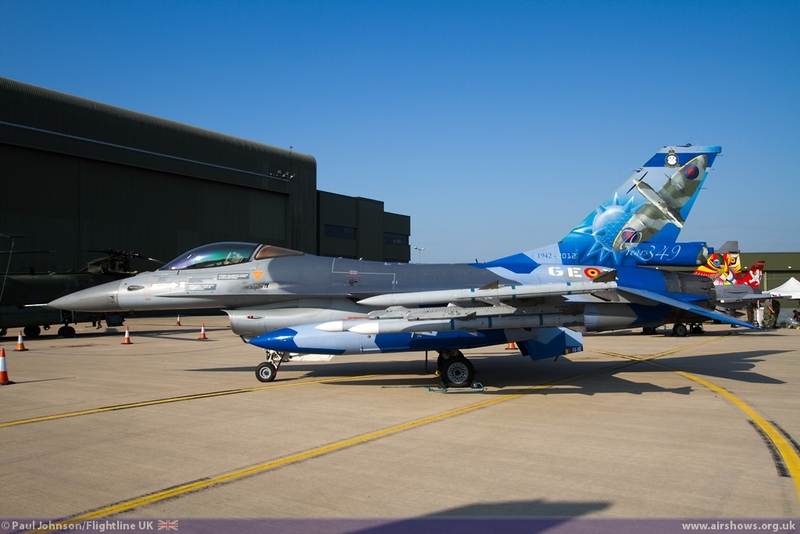 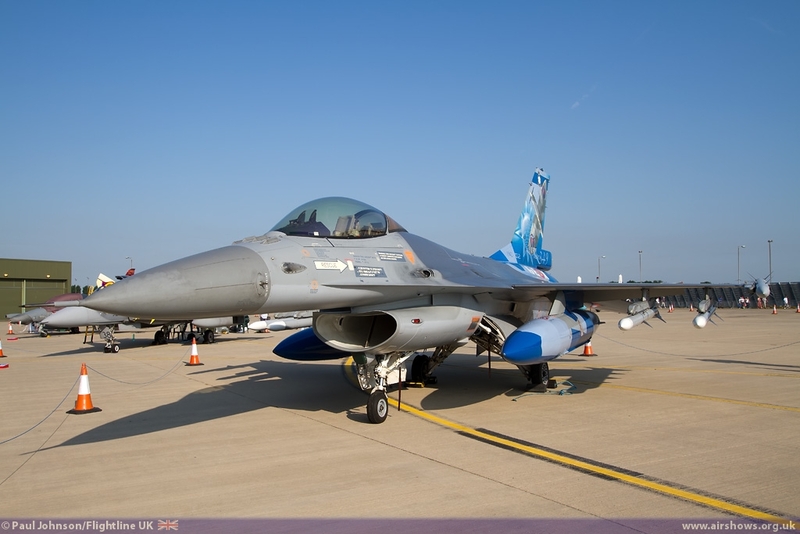 The Belgians brought a pair of F-16AM Fighting Falcons, one wearing anniversary markings while the Czechs showed off a colourful “Tiger” SAAB JAS-39C Gripen and L-159A ALCA. 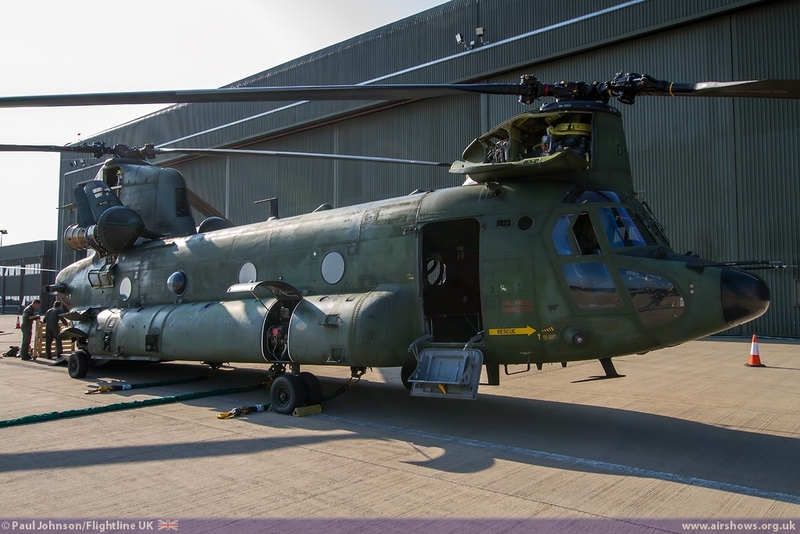 The Royal Netherlands Air Force are always great supporters of UK shows and sent a CH-47D Chinook and AB412SAR to join the Belgian Air Force Agusta A109BA. 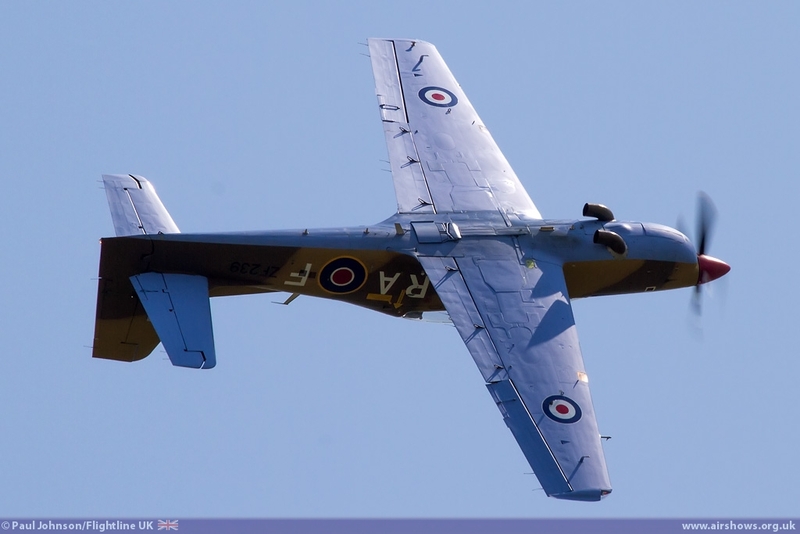 While the static may have felt slightly smaller than usual, the flying display was once again very impressive with some great variety over 7 hours. 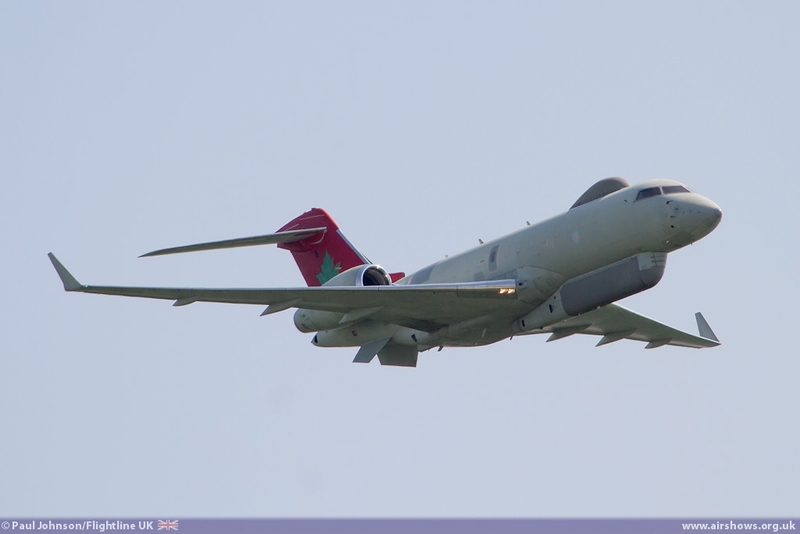 As is tradition as Waddington, the show was opened by the station flypast by the Boeing E-3D Sentry AEW1 and the Bombardier/Raytheon Sentinel R1. 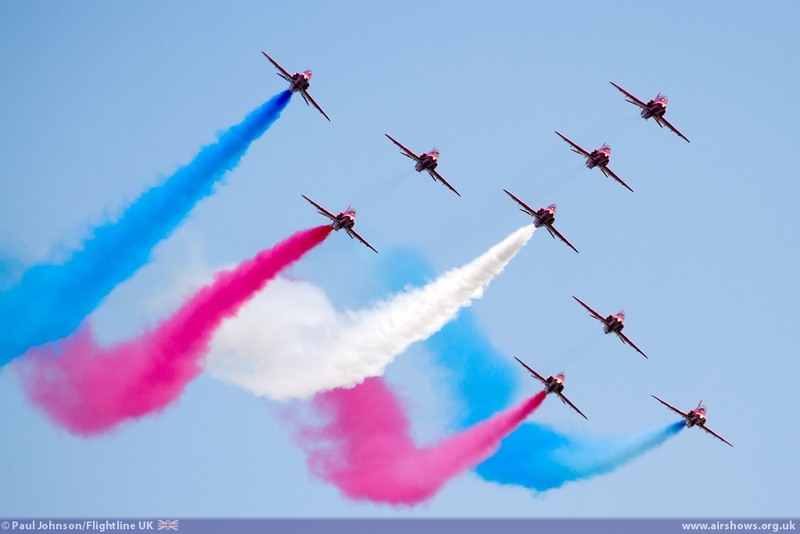 For many of the RAF's displays, it is their local airshow. The Red Arrows as ever were the headline act for the show making the short hop around Lincoln to perform at Waddington. 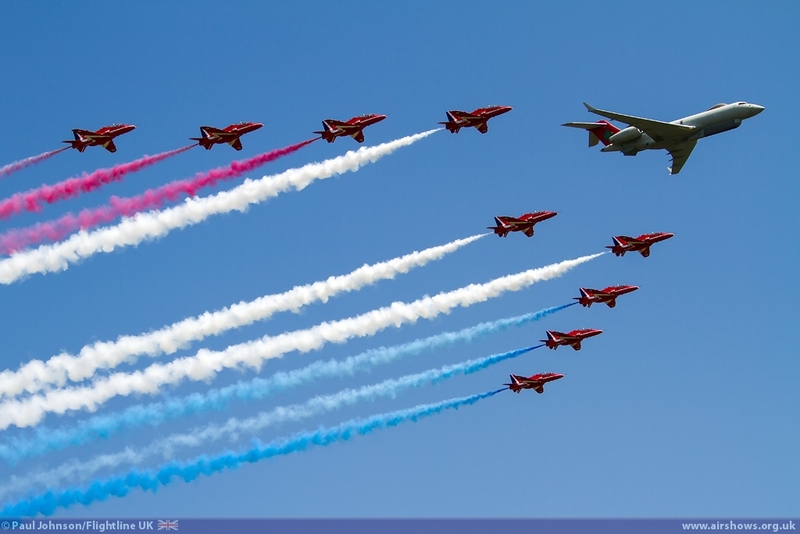 Before their display, the Red Arrows flew in formation with the Sentinel R1 on both days to mark the centenary of V(AC) Squadron before reappearing to perform full displays in the clear blue skies. 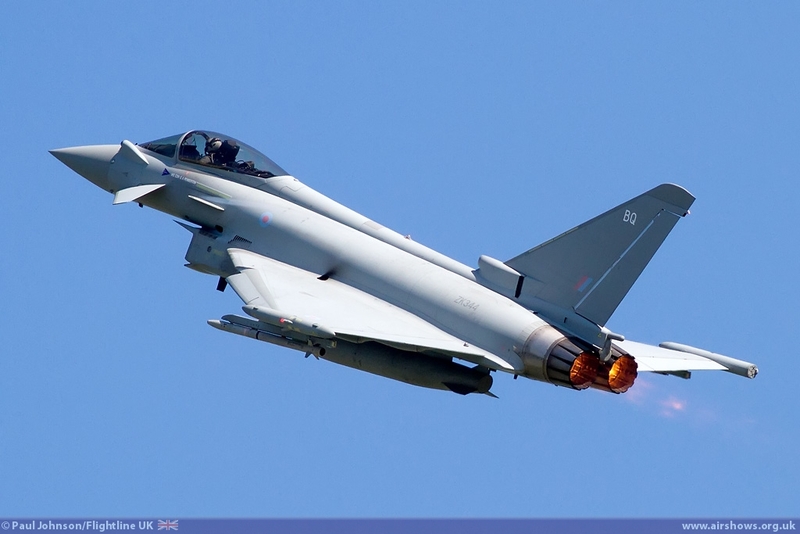 Another local was the RAF Typhoon FGR4 solo flown by Flt Lt Jamie Norris from RAF Coningsby. 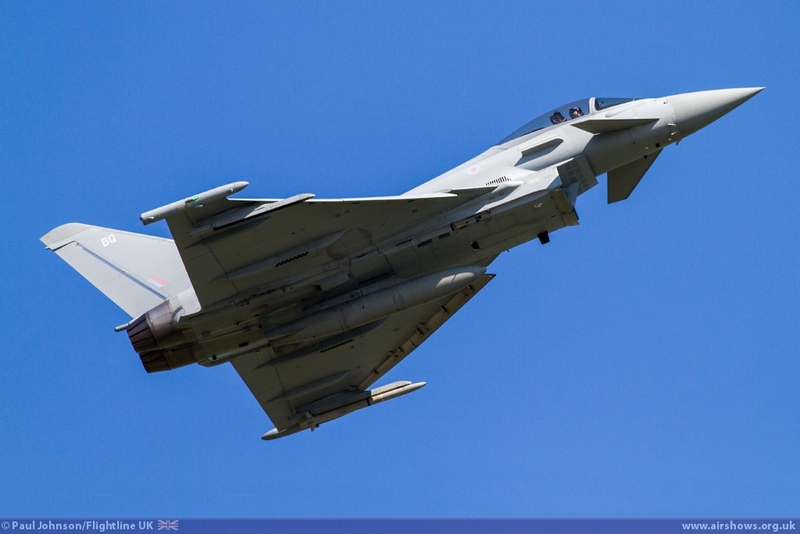 The Typhoon is always a lively performer and Jamie's display highlights some of incredible performance and power of the RAF's main multi-role fighter. 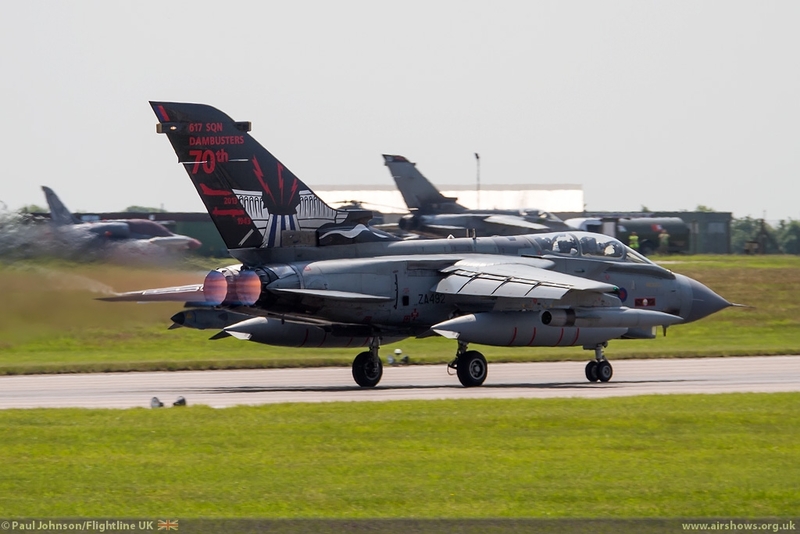 RAF Coningsby is also home to the Battle of Britain Memorial Flight which has had a busy season so far being central to the commemorations of the Dambusters Raid 70 years ago. 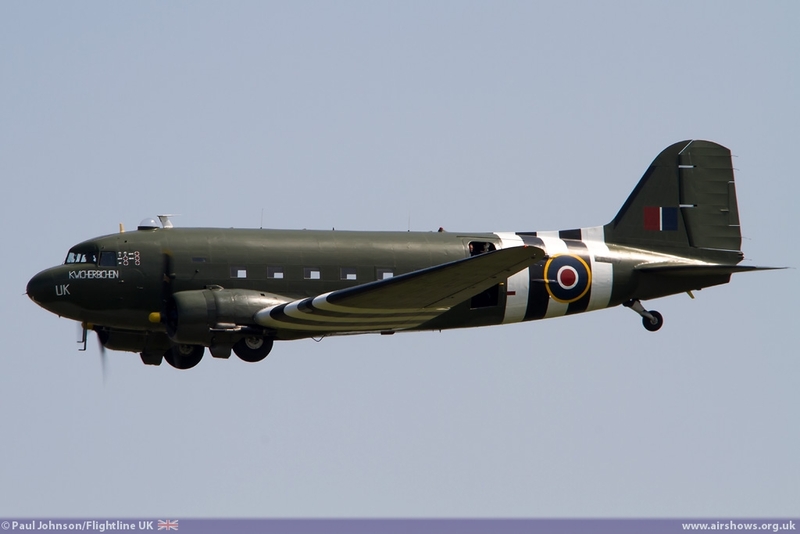 As well as the standard formation of Lancaster, Spitfire and Hurricane which appeared on both days, the flight's Douglas Dakota III make a quick surprise flypast on Sunday returning from other commitments with former King Air display pilot Leon Creese at the controls. 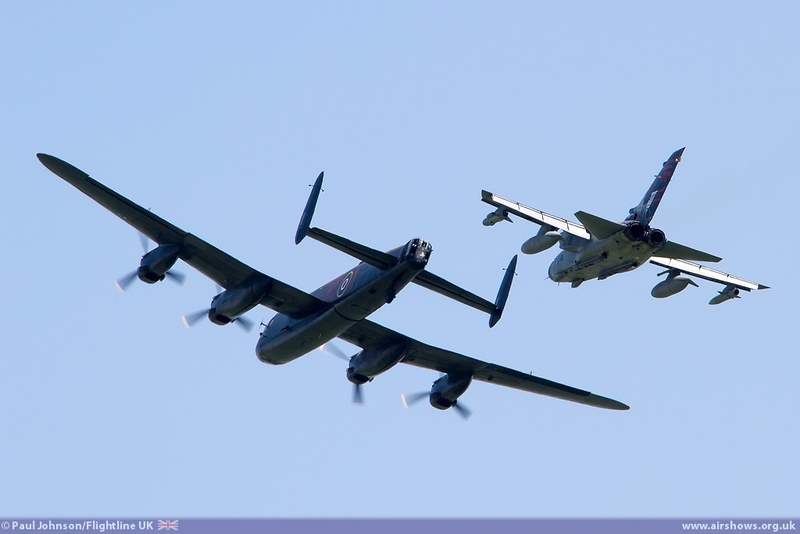 To commemorate the Dambusters, The Avro Lancaster also formed up with one of 617 Squadron's Panavia Tornado GR4s for a single flypast marking those 70 years which has seen 617 remain at the forefront of the RAF's strike force. 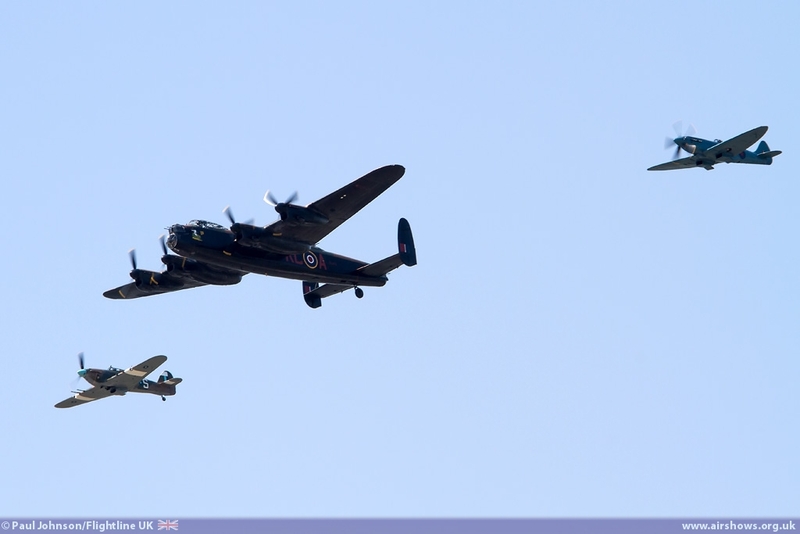 Special mention should be made of the engineers at the BBMF who worked through the night on the Friday before the show to get the Lancaster airworthy following a significant hydraulic problem was found! As ever, all of the RAF's public display teams were represented with the RAF Falcons Parachute Team, Shorts Tucano T1 solo and the Boeing Chinook HC2 performing throughout the afternoon. 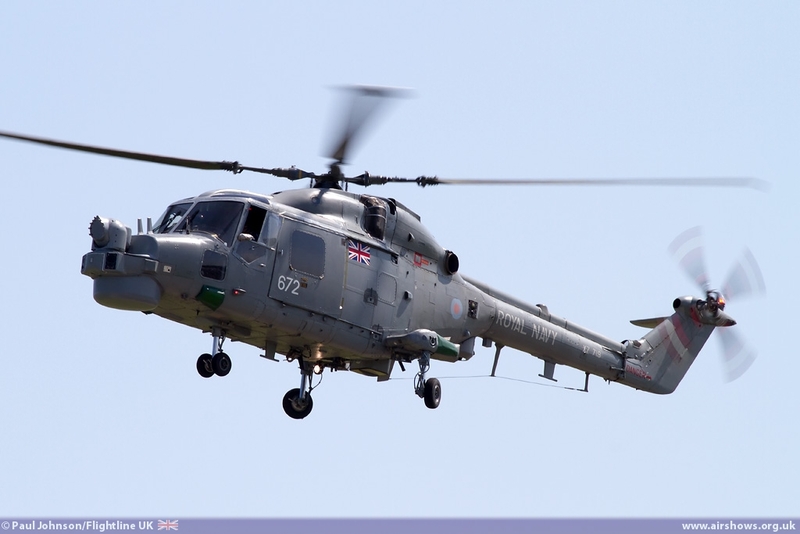 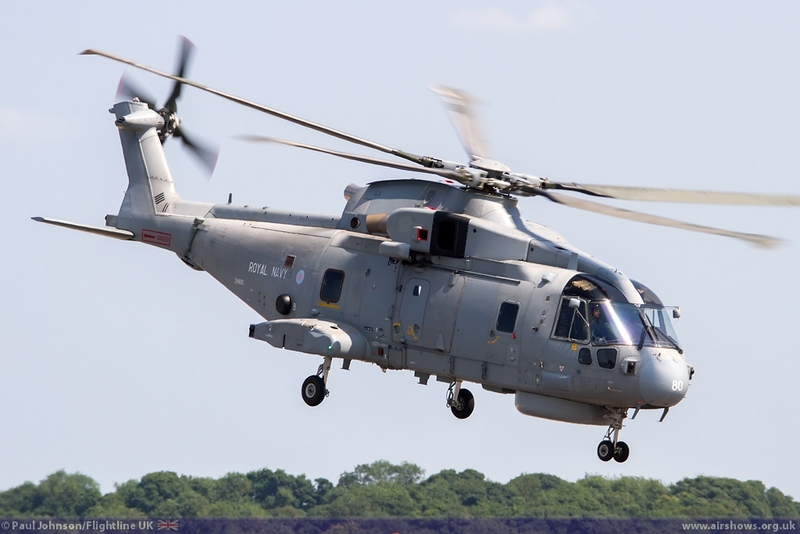 The Royal Navy also participated in the flying displays with the solo Westland Lynx HMA8 from the Black Cats Helicopter Display Team. 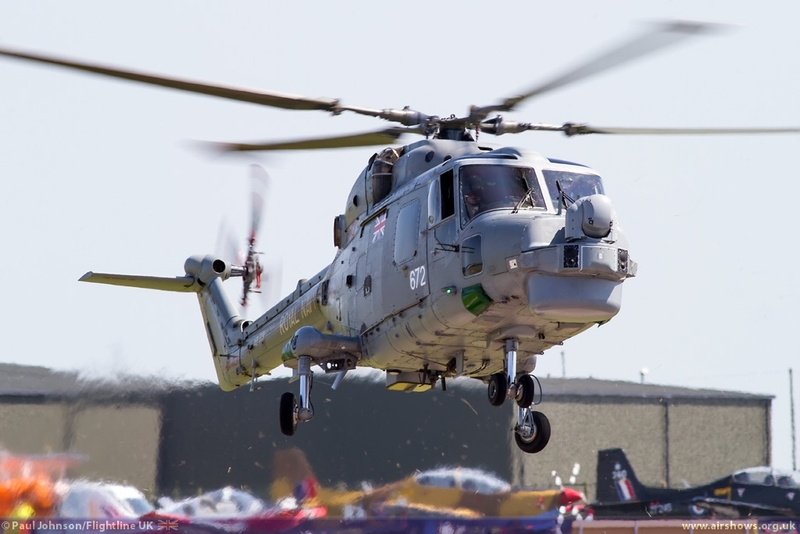 With the current operations tempo and the transition of the Lynx fleet to the new Wildcat helicopter, the Black Cats are only able to present a solo display this year, but it remains just as impressive. 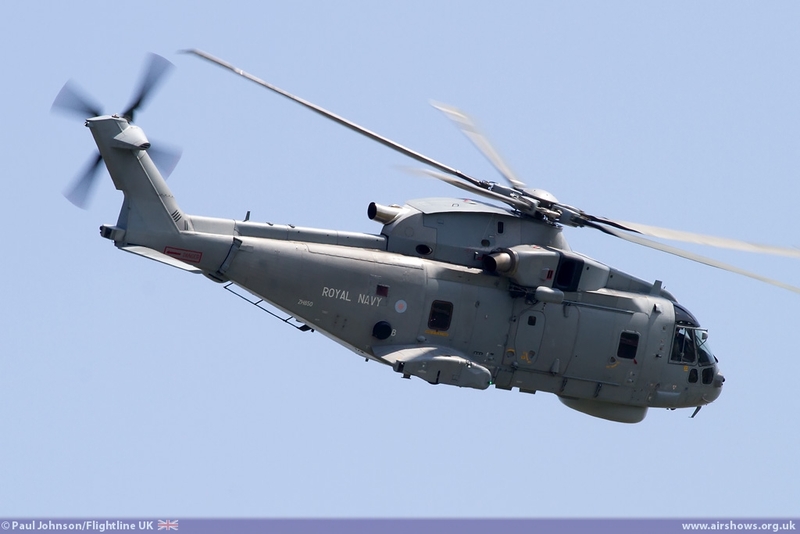 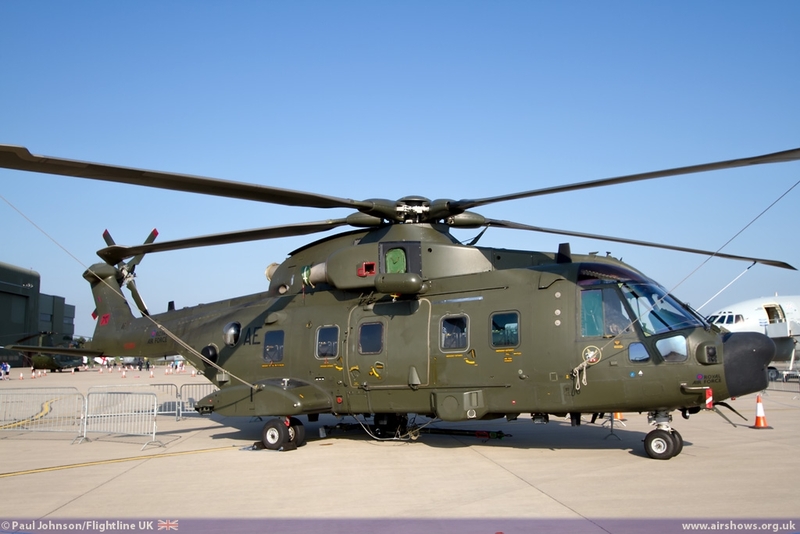 A rarer performer was the Westland Merlin HM2 from 824 NAS at RNAS Culdrose in Cornwall which has incredible presence for a helicopter at airshows. 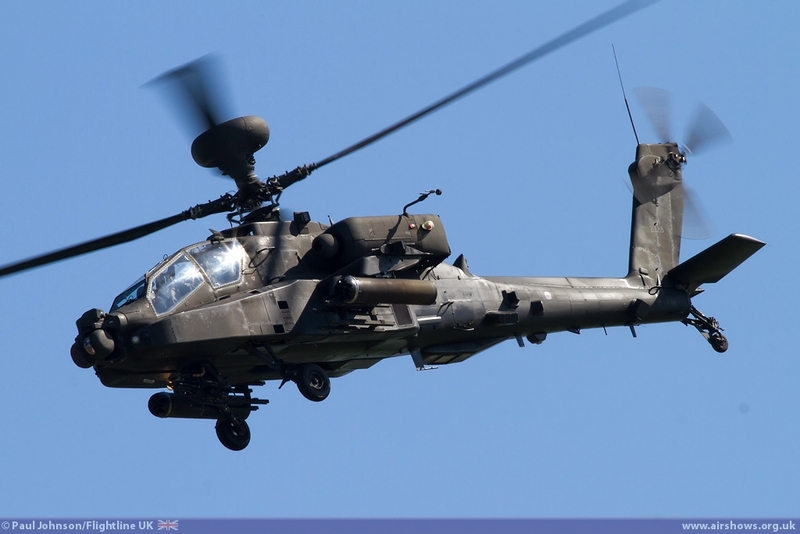 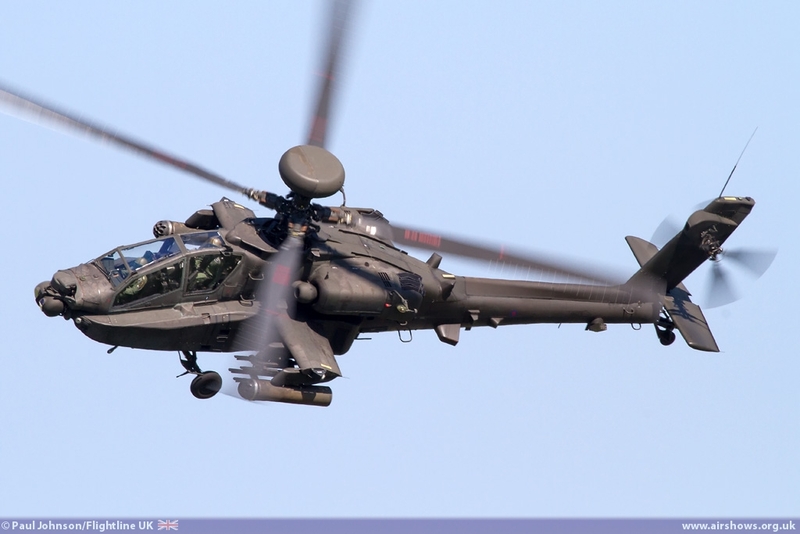 The Army Air Corps also took part in the flying display with the WAH-64D Apache AH1 from Wattisham. 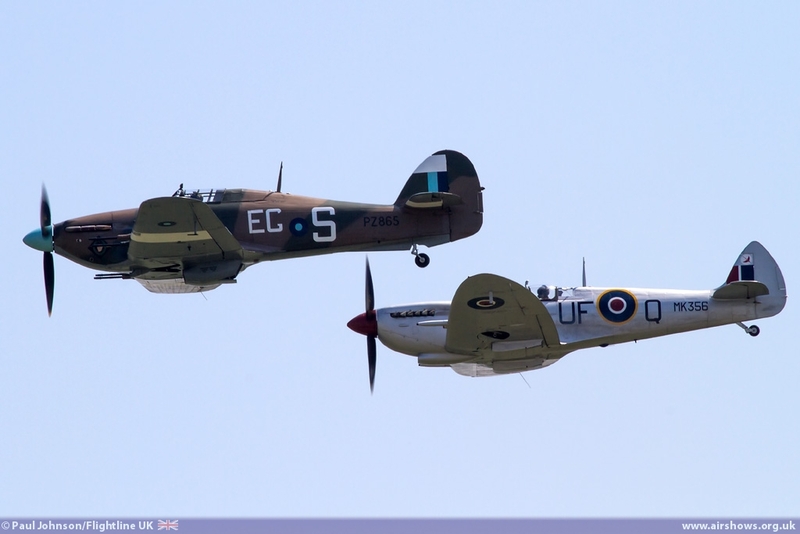 The flying display also contained a number of classic aircraft. 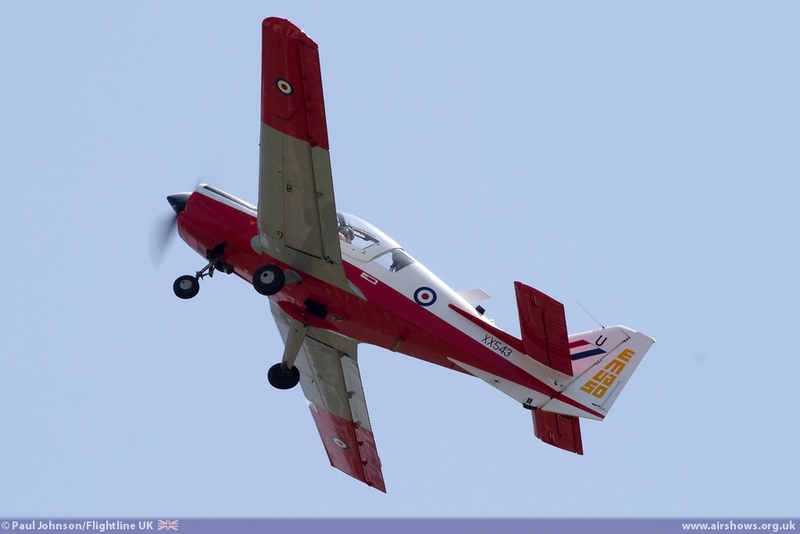 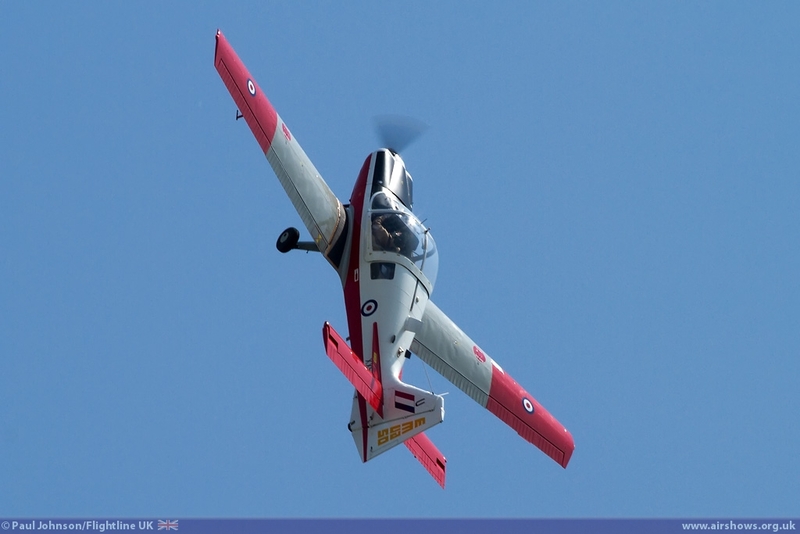 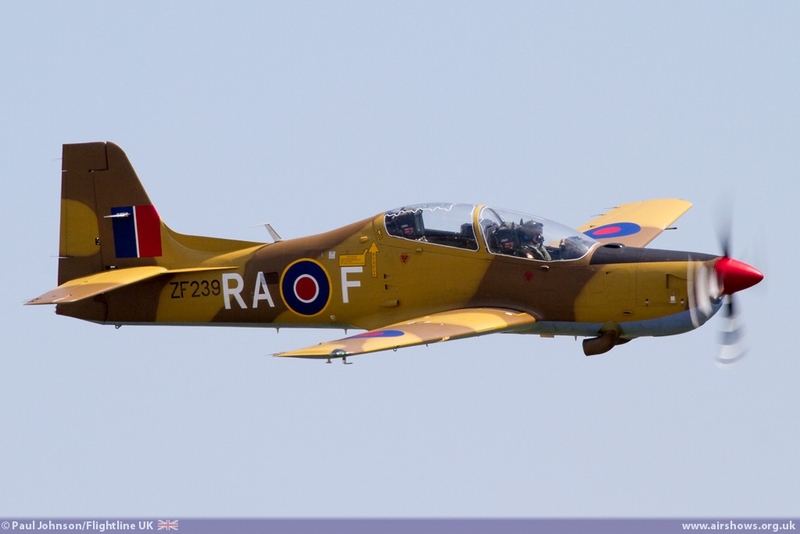 Rod Dean flew the Scottish Aviation Bulldog T1 through a sharp aerobatic routine. 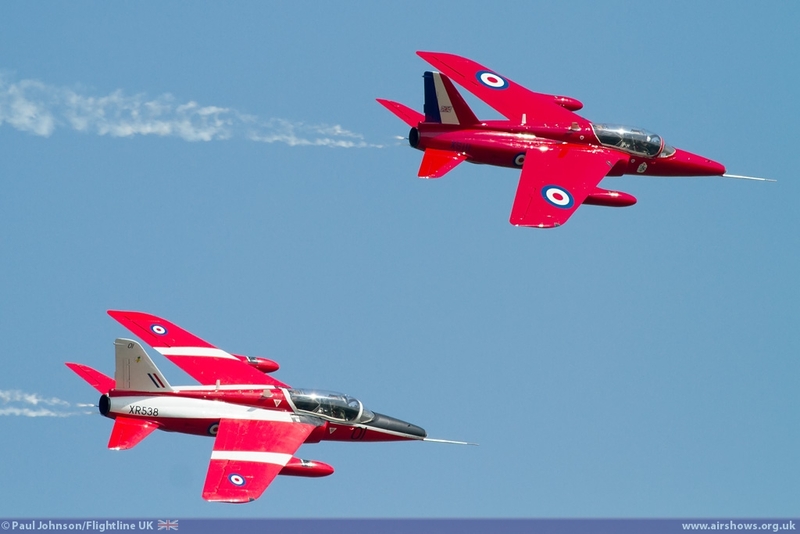 Further cold war RAF training aircraft came from the Gnat Display Team with their wonderful pair of Folland Gnat T1s. 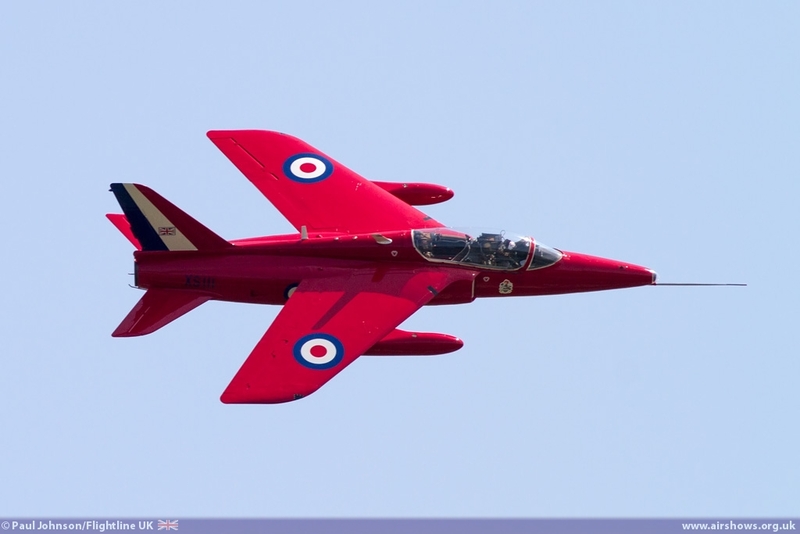 Their 'Red Arrows' marked examples has just been freshly repainted in a later Red Arrows colour scheme which gleamed in the Lincolnshire skies. 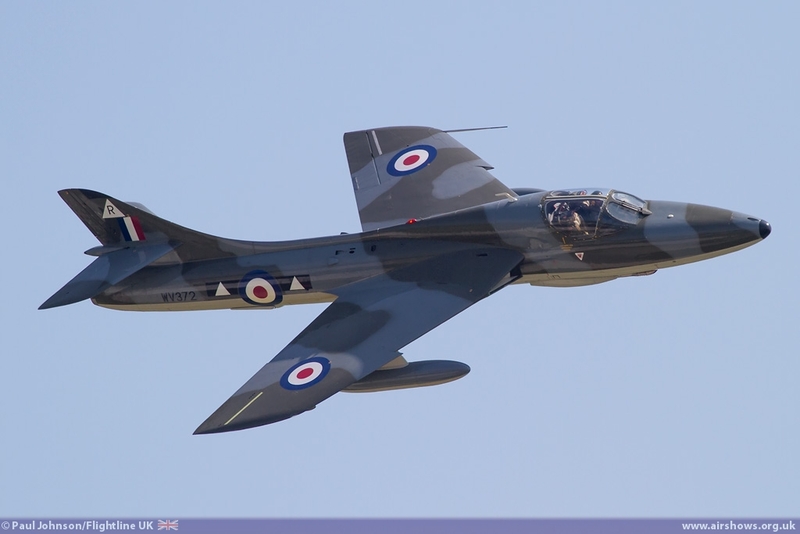 Further RAF Classic Jet action came on Sunday with Chris Heames displaying the Hunter Flying Academy's Hawker Hunter T7 WV372 wearing the colours of II (AC) Squadron. 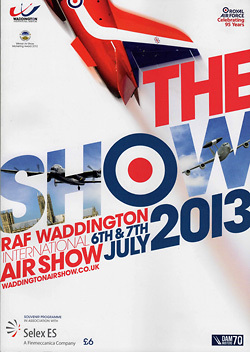 With Waddington's close association with the type, the show is an important one for Avro Vulcan B2 XH558. 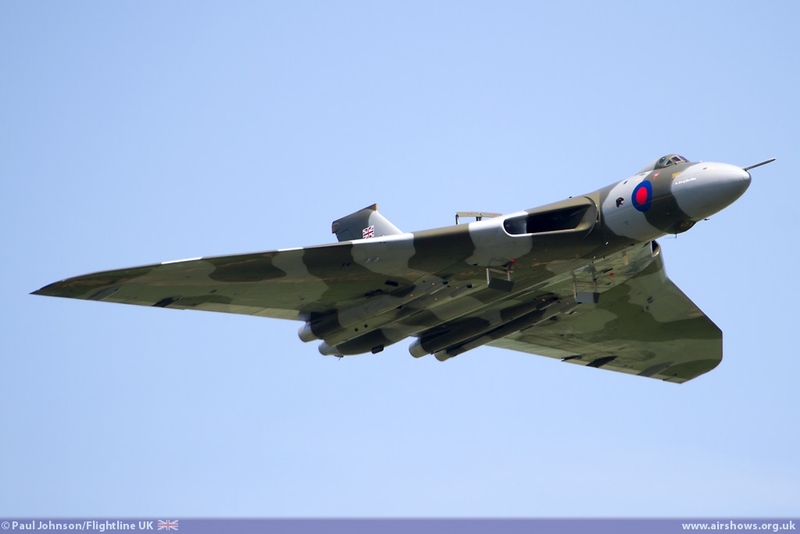 The aircraft remains as popular as ever with the Lincolnshire crowds who always respond to the howl and roar XH558 makes during her display which was flown by Bill Ramsey n Saturday and Kev Rumens on the Sunday. 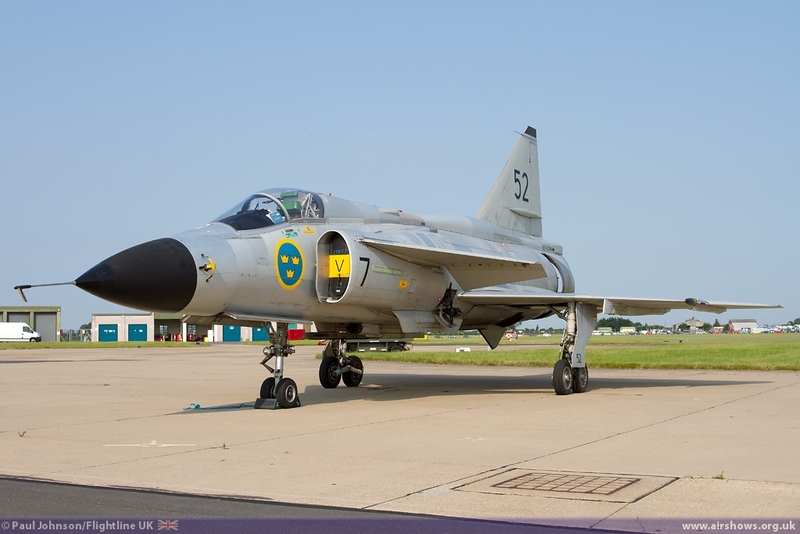 However some of the Vulcan's thunder was perhaps stolen in many people's eyes by the presence of the Swedish Air Force Historic Flight with three exciting SAAB classic jets. 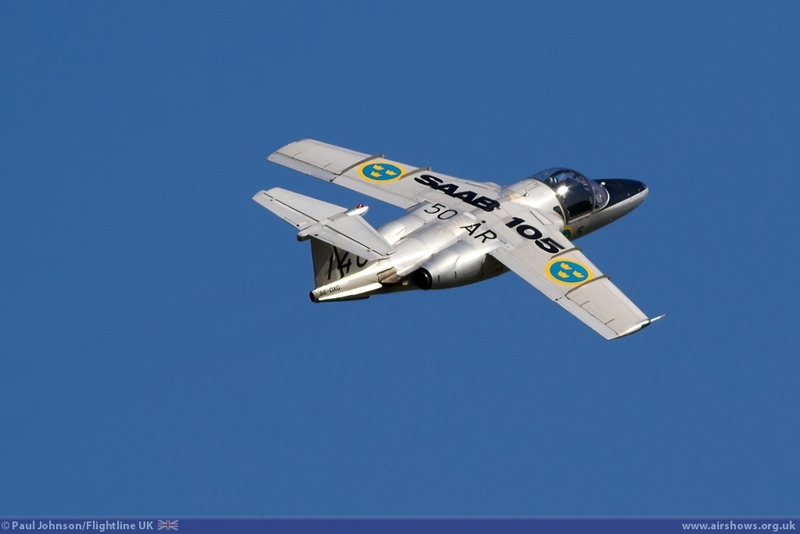 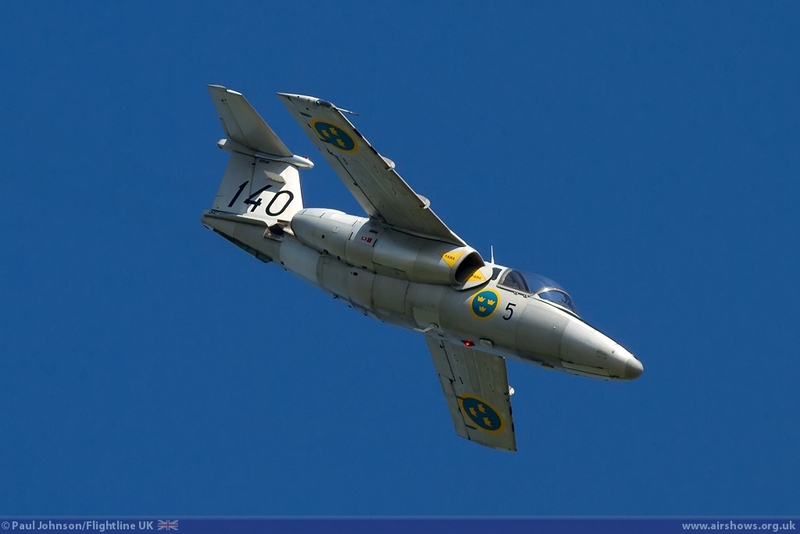 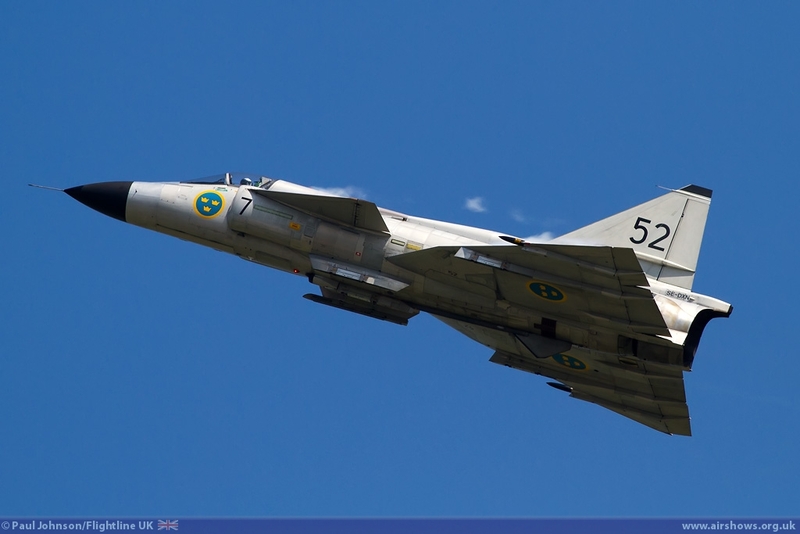 The flight displayed it's SAAB Sk60 (105), J29F Tunnan and the AJS37 Viggen which the latter being the absolute highlight for many. 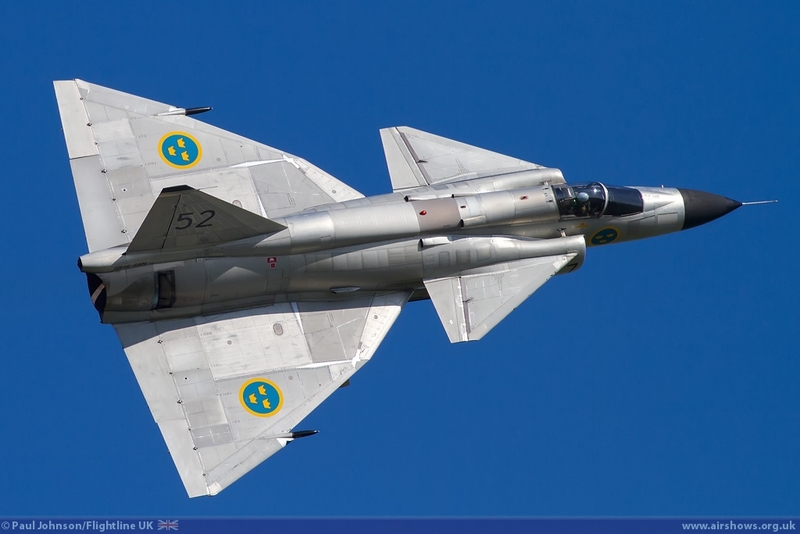 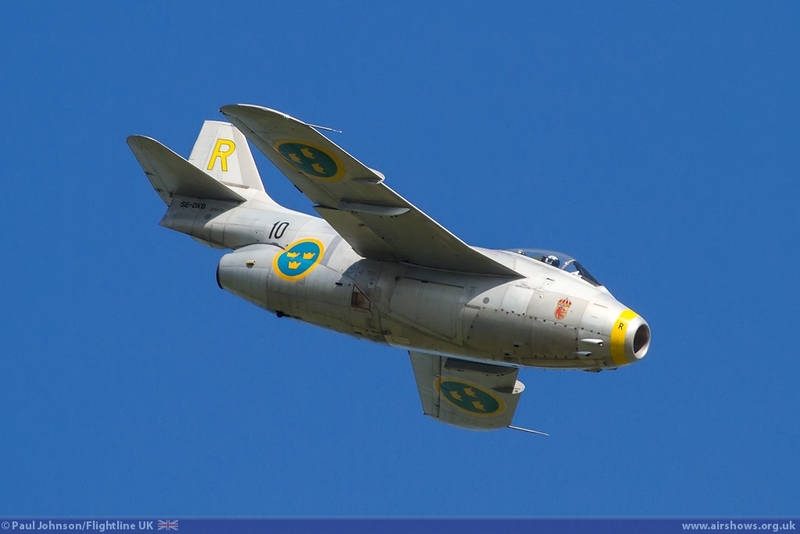 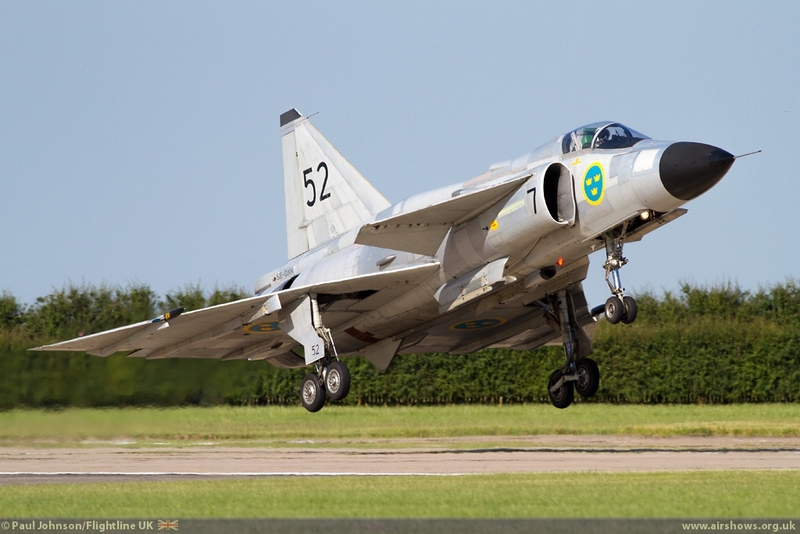 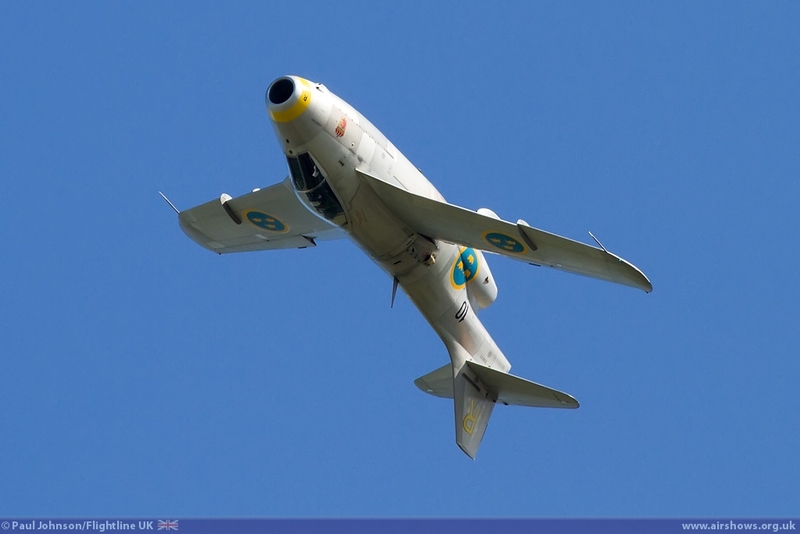 The Viggen certainly gives a thunderous performance, though the Tunnan in particular is a superb performer and in the author's mind, puts on the best display of the three! 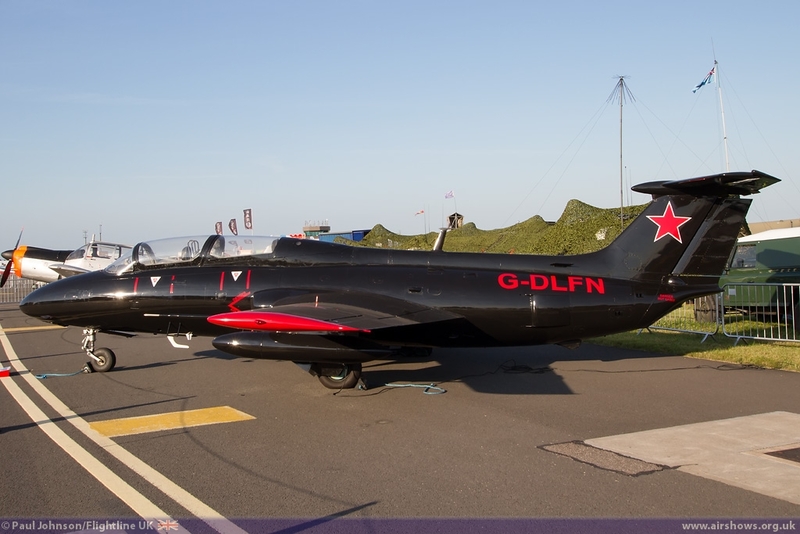 The appearance of the SwAFHF was significant as it was the first UK mainland display by the Viggen and the flights first ever appearance in England having previously been seen at Leuchars in Scotland and of course Jersey. 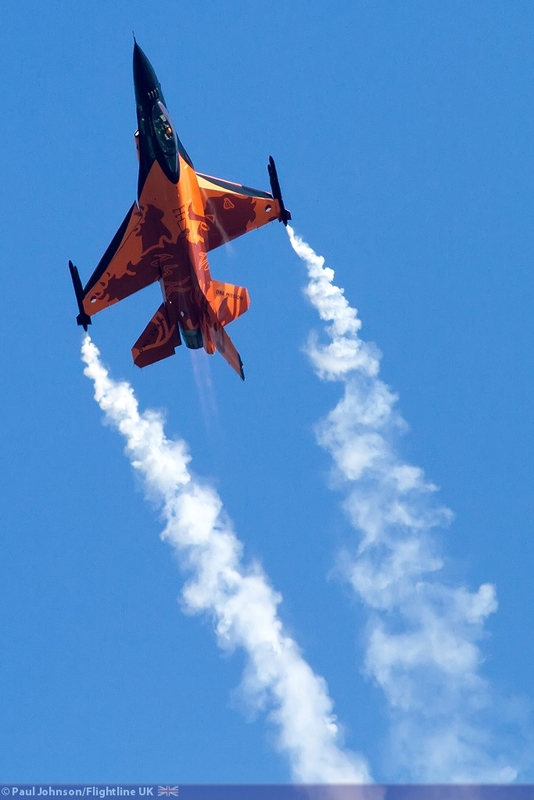 Current international military hardware was also plentiful in the flying display. 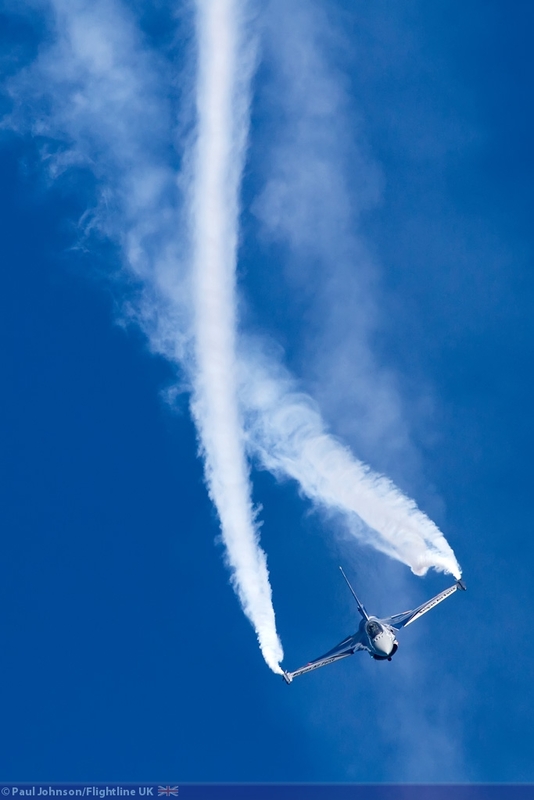 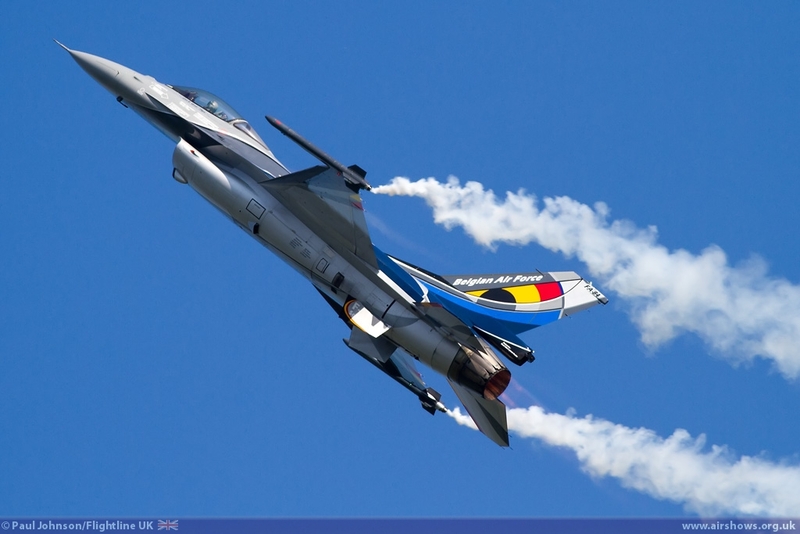 There were no less than three different F-16 Fighting Falcon displays in the flying. 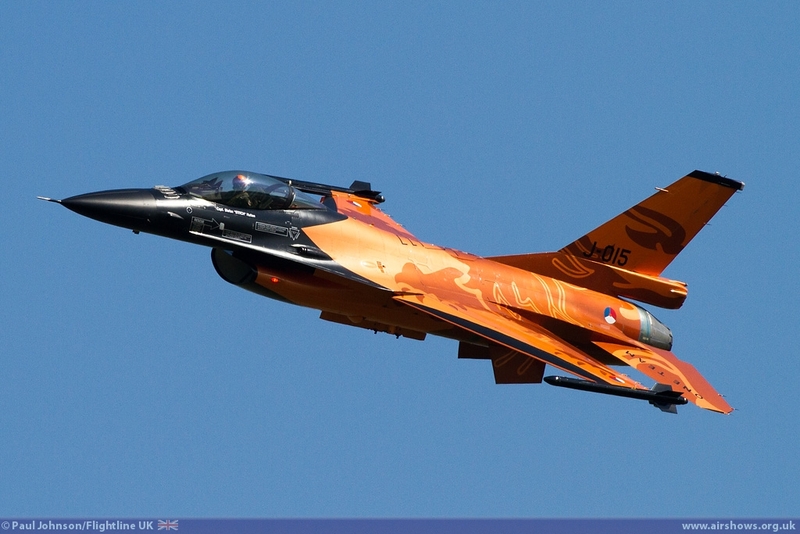 The Belgian and Dutch F-16 Demo Teams maybe regulars, but their colourful F-16AMs are always put through impressive displays. 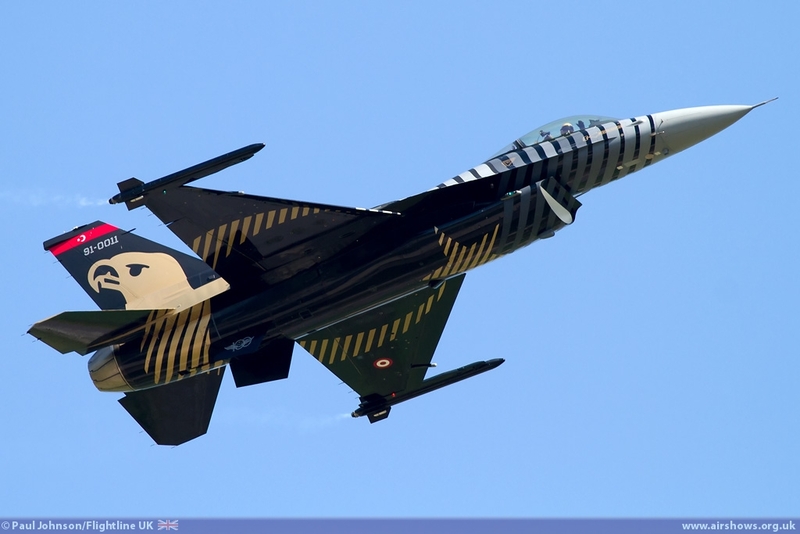 It was however the second only appearance by the Turkish Air Force F-16C Fighting Falcon 'Soloturk.' 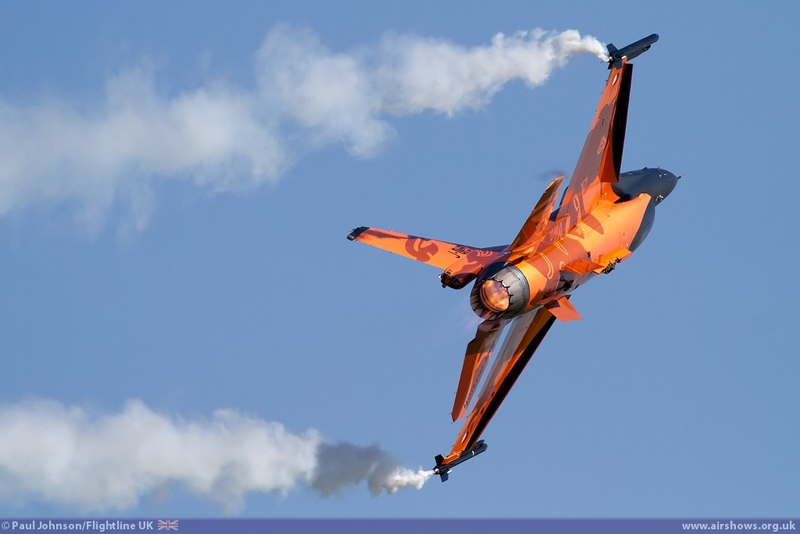 The extra power of the F-16C is immediately apparent and the display is full of flair and noise! 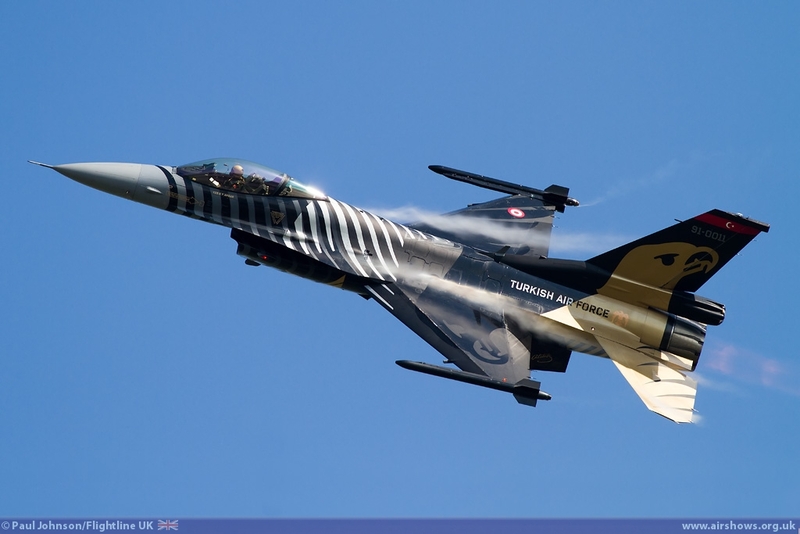 But the flair of the display was not limited to the actual flying display, the Solo Turk's commentator was equally entertaining with his exuberant description of the display! 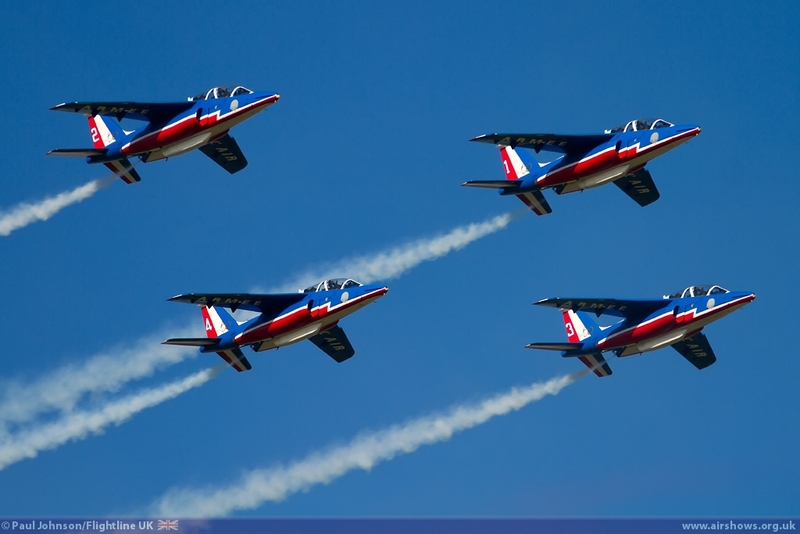 The Czech Air Force had two displays in the flying. 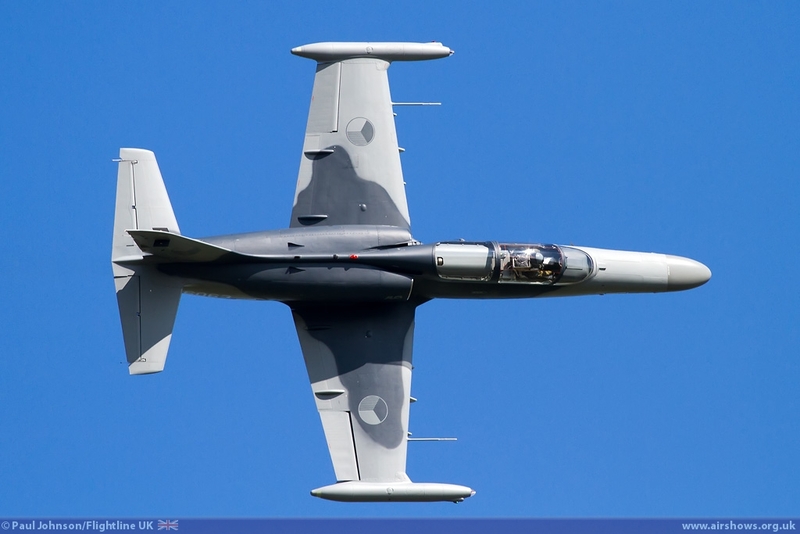 The indigenous Aero L-159A ALCA has been a regular at Waddington over the years and it was good to see it back. 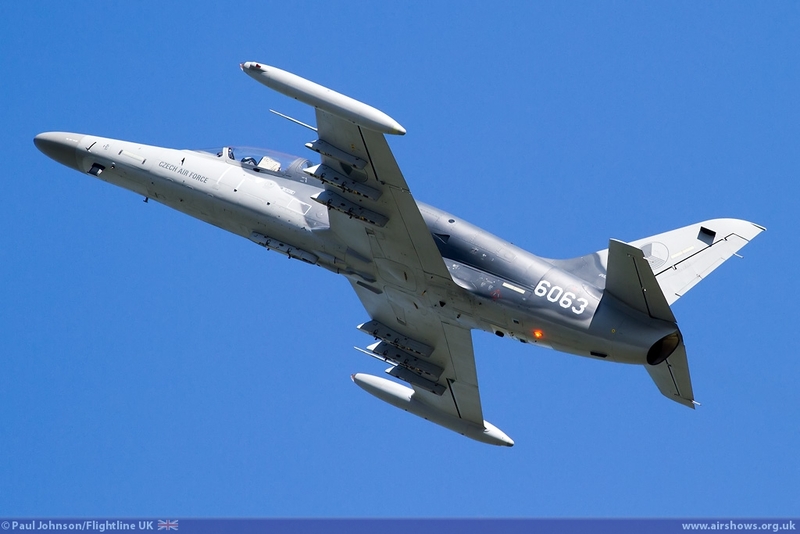 Considering it's lineage from the under-powered L-39 Albatros, the L-159 puts on a very punchy display which certainly catches the attention. 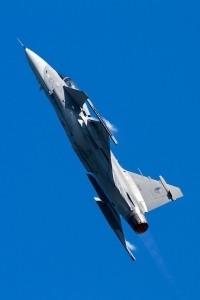 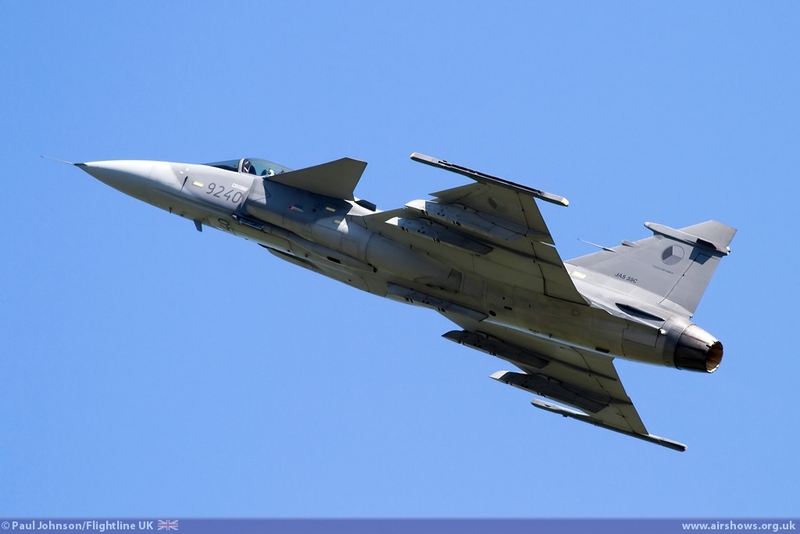 However, the SAAB JAS-39C Gripen is certainly the star of the Czech displays. 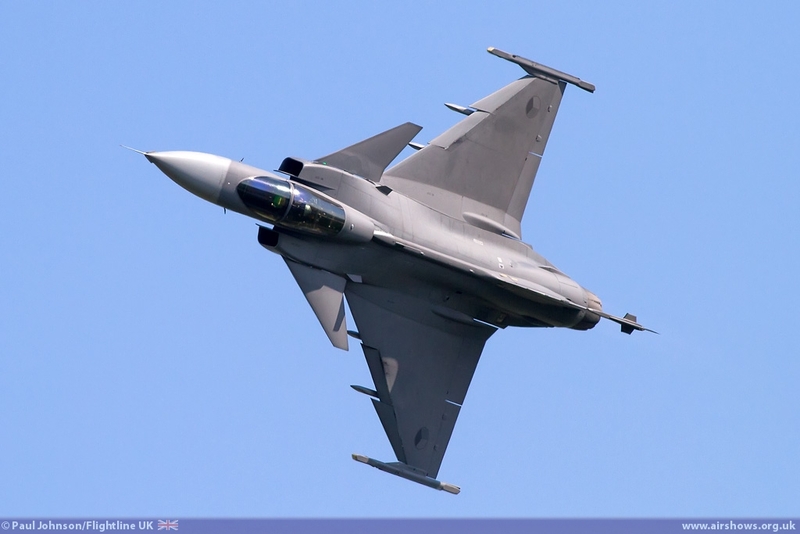 The Gripen is capable of an amazing turn of speed and tore around the clear Lincolnshire skies with much aplomb. 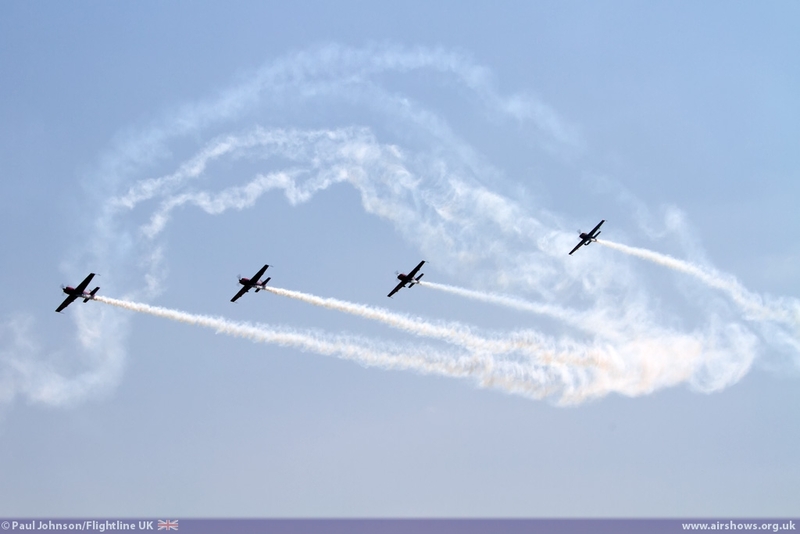 There were of course civilian performers too. 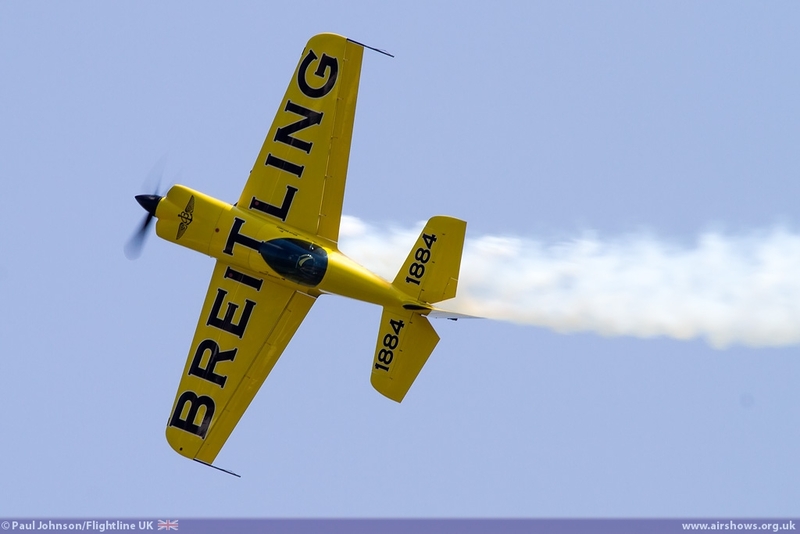 Mika Borgeot made his UK flyig display debut in the Breitling sponsored Xtreme Air XA41 showing off the superb characteristics of this latest generation of competition aerobatic aircraft. 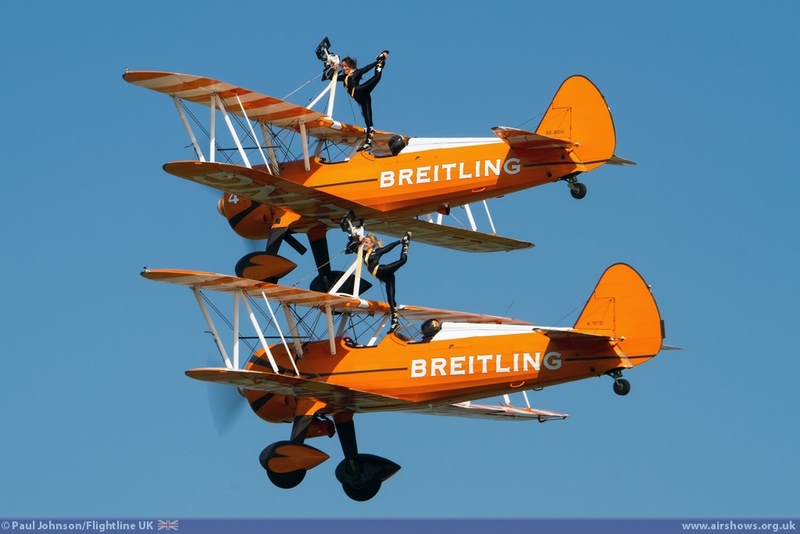 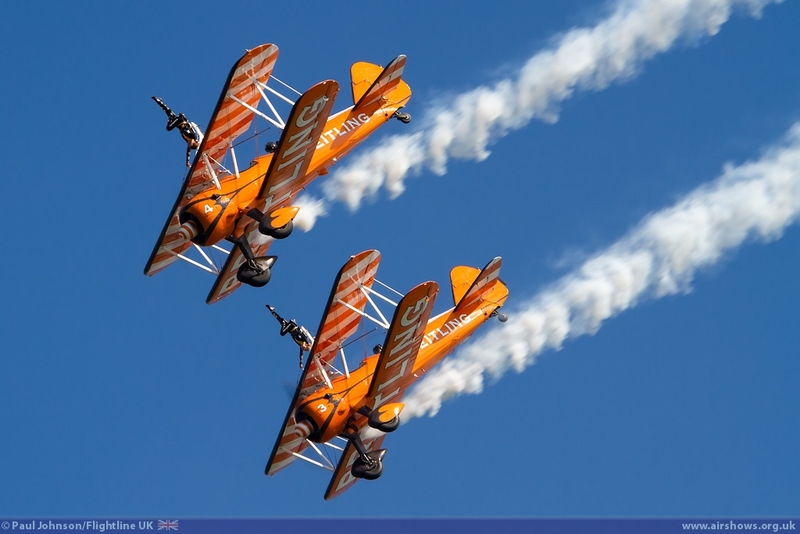 Also from Breitling, the Breitling Wingwalkers made a welcome return to Waddington with their pairs routine. 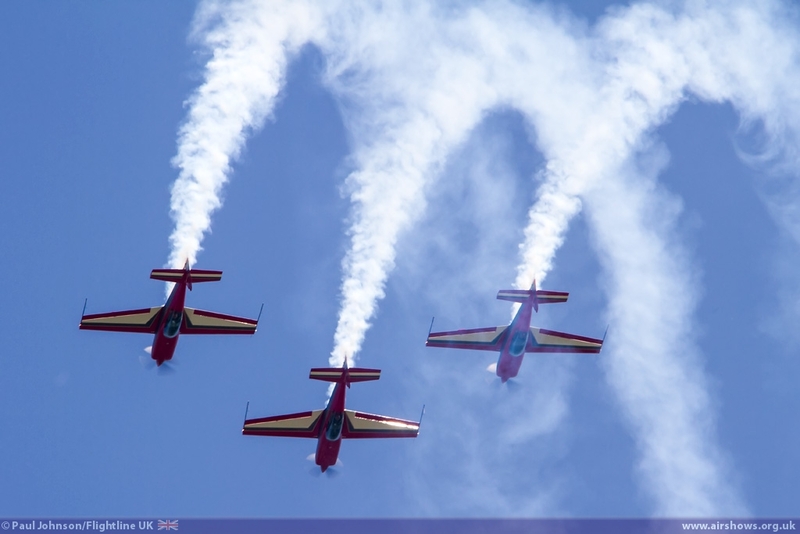 The Blades also appeared on both days of the show with their stunning display of precision flying. 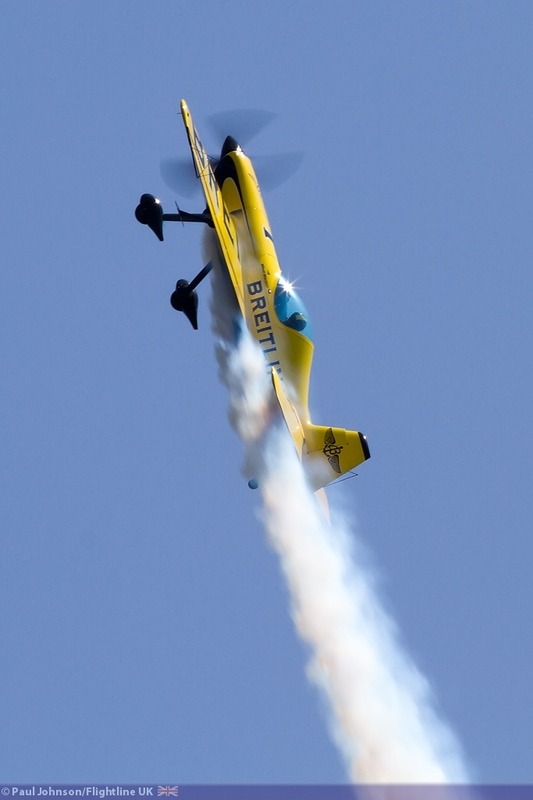 It was certainly a very popular airshow this year with massive crowds. 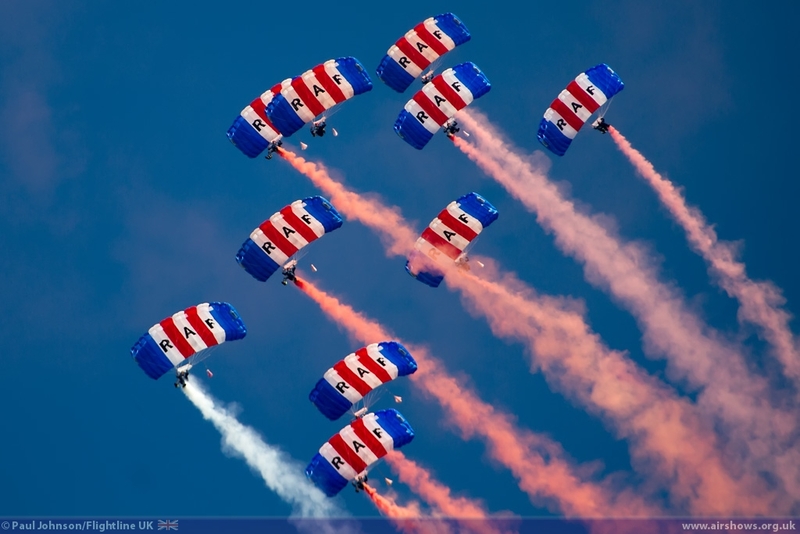 Saturday in particular was particularly busy with capacity crowd of at least 78,000!!! 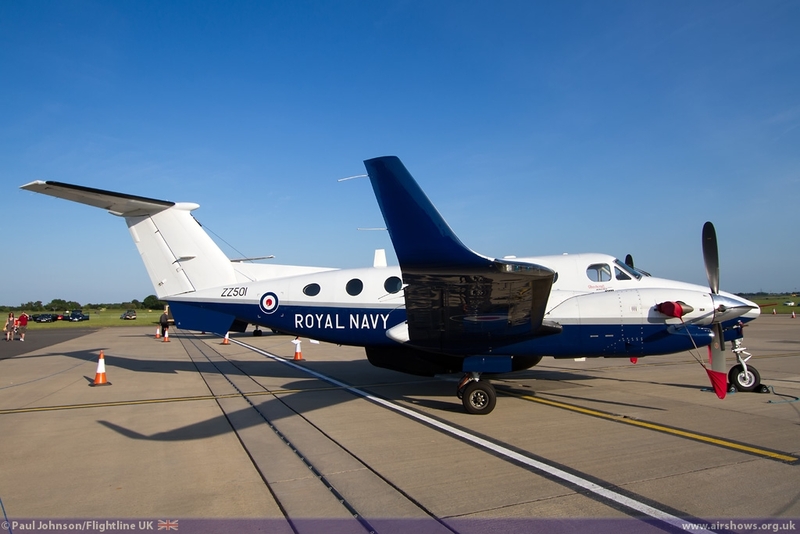 Sunday too was busy, though it was noticably easier to get in and out perhaps due to Andy Murray playing in and eventually winning the Wimbledon Mens Singles final. 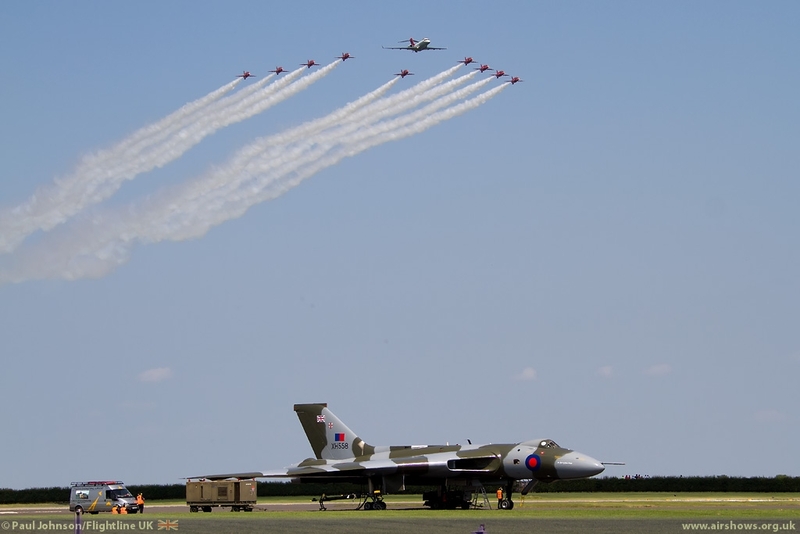 Waddington's Airshow team must be congratulated because all their hard work prodcued an excellent event with some great attractions on the ground and some very special flying displays that will live long in spectators memories. 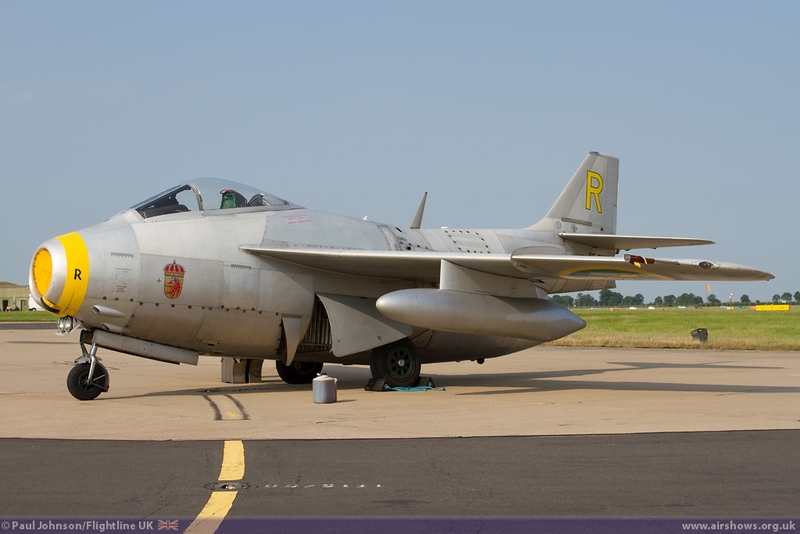 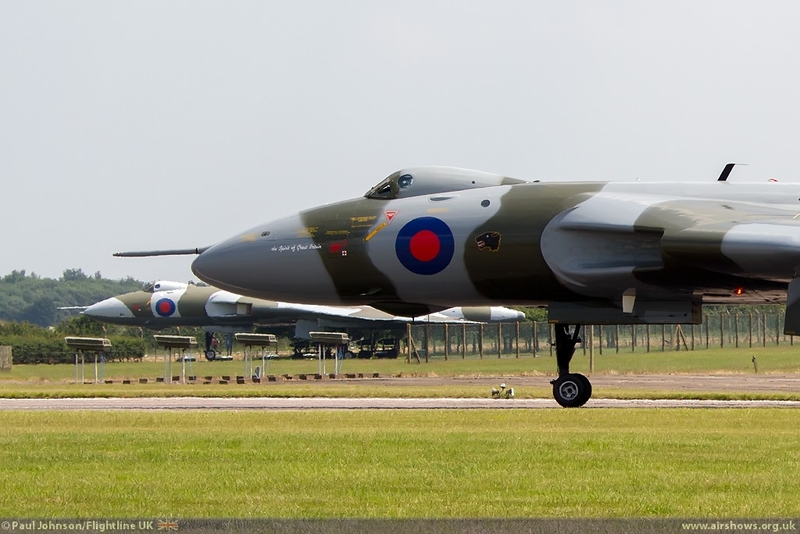 Roll on Waddington 2014!